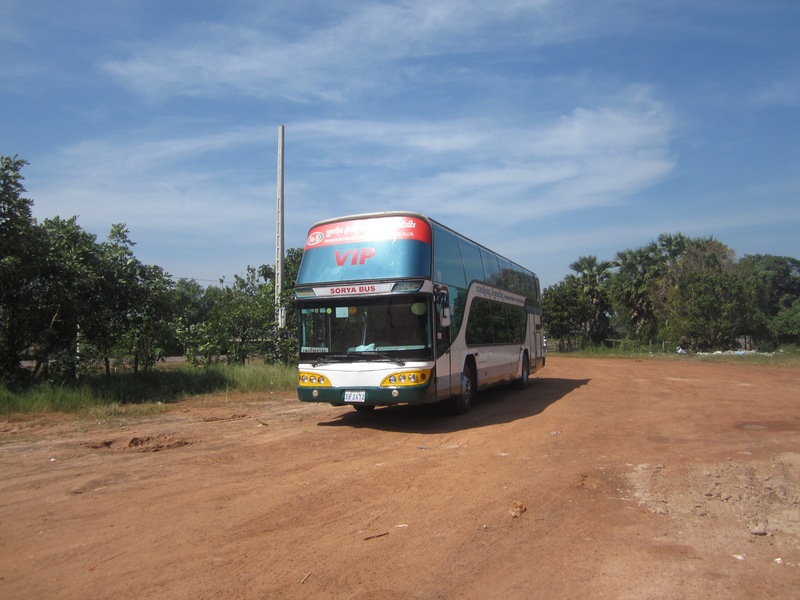 A very budget friendly way to get from Sihanoukville, Cambodia to Bangkok, Thailand is to book a bus for a land crossing. You have two options: a night bus or a day bus. The night bus is more comfortable (you actually have a double bed instead of standard bus seats) but it takes several hours longer as it takes a route north to Phnom Penh before driving to the Thai border. The day bus takes a more direct route along the coast. Both times are the same price, about $17 per person. We chose the day bus. We were picked up at our hotel at 7:00am and arrived in Bangkok at about 7pm. 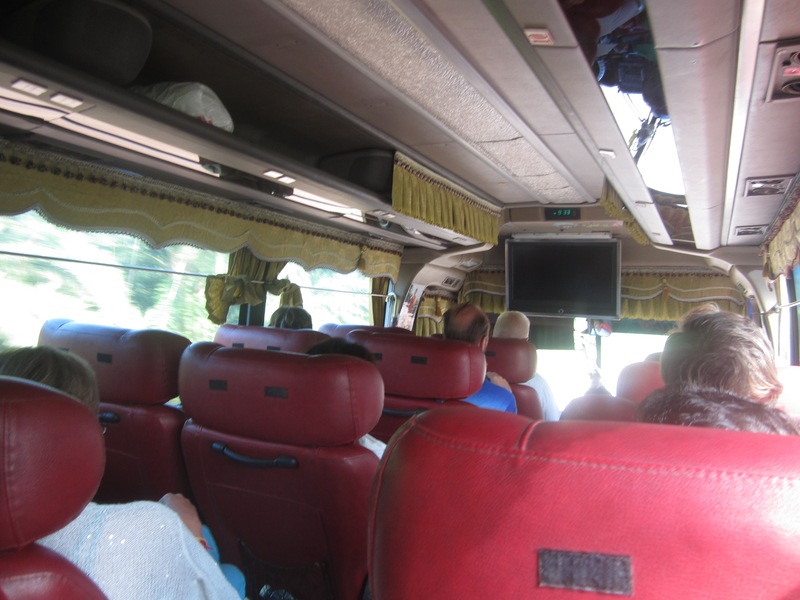 The bus on the Cambodia side was fairly comfortable, decent seats and working air conditioning. Halfway through the day we arrived at the Thai border. Here you have to take everything off the bus (it will turn around and leave again so do not leave anything on the bus). You then carry your baggage across the border to the customs offices and wait in line for your visa or passport stamp. 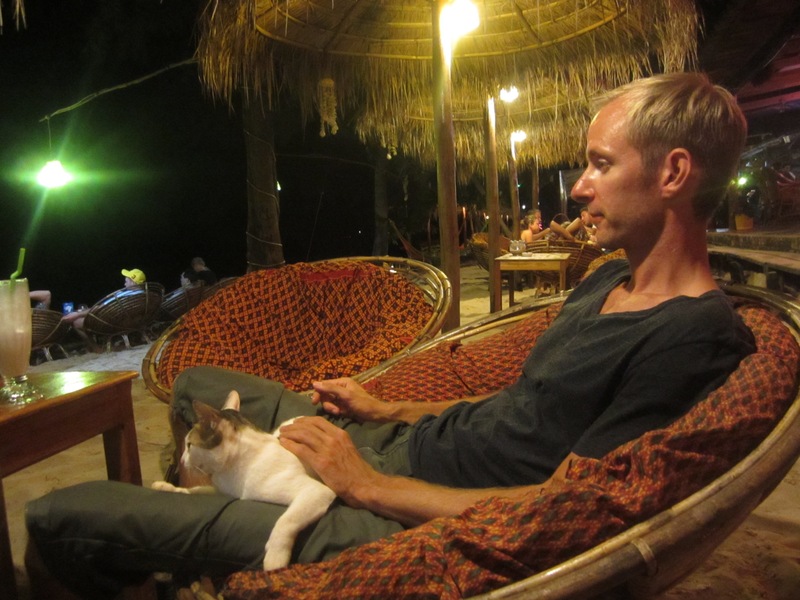 Being from USA and Denmark neither Glenn nor I needed a visa to enter Thailand. We simply had to fill out an arrivals form and wait in line for a passport stamp. Typically you are only given 2 weeks visa when you do a land crossing. This is the amount of time Glenn received. However, for seemingly no reason I was given 30 days. It seems like it depends on both what country you come from and on which customs officer you get. Either way the process was relatively easy. Once you have your passport stamp/visa you continuer across the border to an area where the streets are lined with shops and food stands. This is where you will struggle to fine your next bus. 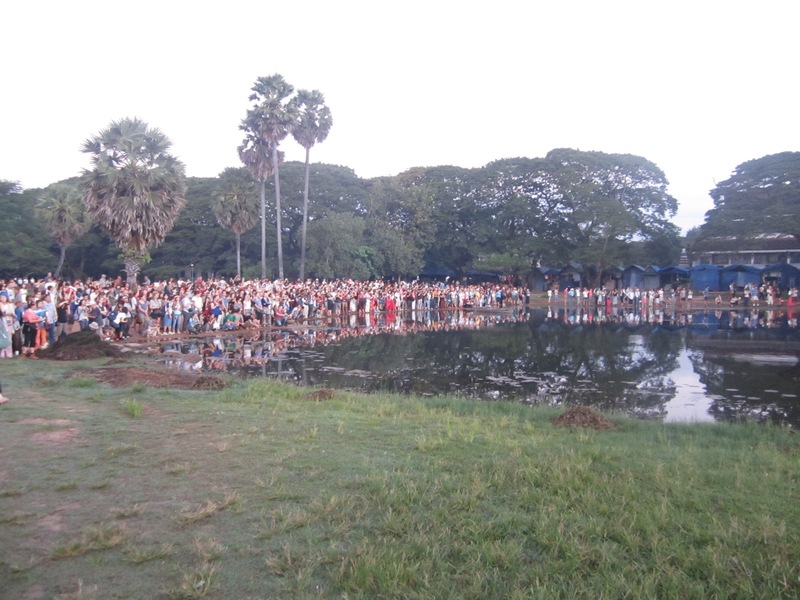 The staff from your first bus in Cambodia have left and there are no signs directing you to any buses on the Thai side. The only option is to find people who look like they might be drivers and show them your ticket until you find the right one. I found this process incredibly stressful and difficult. Once we finally found our bus we discovered it was actually a minivan, 11 people crammed into a Minivan for a 6 hour drive on bumpy mountain roads. My only recommendation is don’t look out the window. The drivers drive like maniacs and the less you look out the window the less sick you will feel (at least in theory). Art of the trip was that there were some really nice people in our van that we talked with during the trip. This made the trip feel a bit shorter and was basically the only thing we could do on the drive because it was so bumpy (reading and using a tablet was impossible). 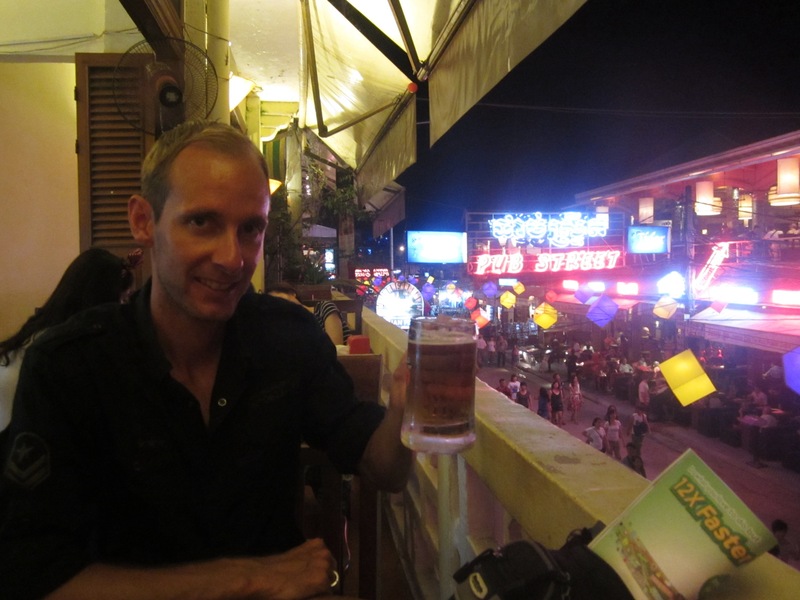 When we finally arrived in Bangkok we were dropped off at Khao San Road, the main backpacker area. From there Glenn and I hailed a taxi to take us to our hotel. Overall we made out ok with the land crossing and it did save us a lot of money but I really did not enjoy the experience. If you can afford to fly I recommend it because it is faster and so much less stressful. We had only one night layover in Bangkok before our morning flight to Myanmar the next day so we booked a small hotel near Don Mueng Airport. The hotel we booked was a bit challenging for the taxi driver to find (they do not use gps) so be sure you have a map to help them. Here is what the outside looks like to help you find it. Once we found it the hotel was great. Lovely staff (though they don’t speak much English so be prepared to act out some things). 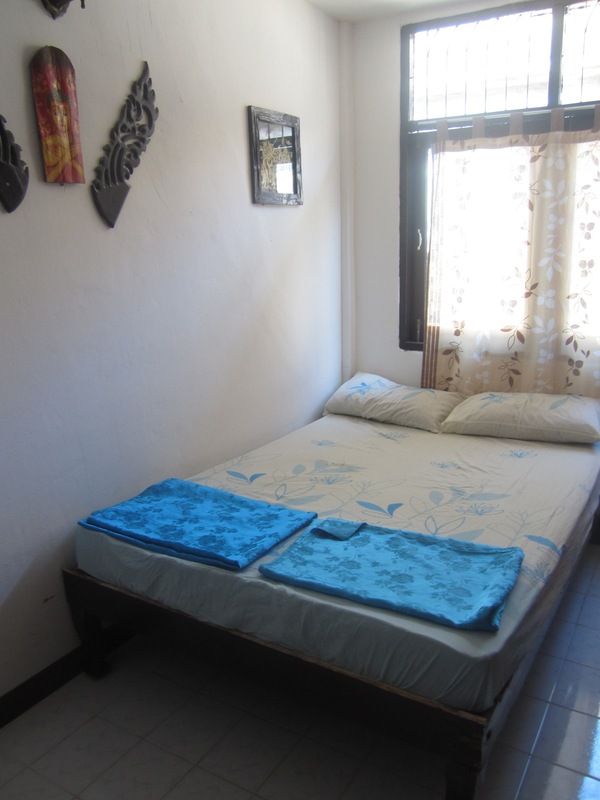 The rooms and bathrooms are small and basic but impeccably clean and air conditioned. It is really a perfect hotel for a layover. 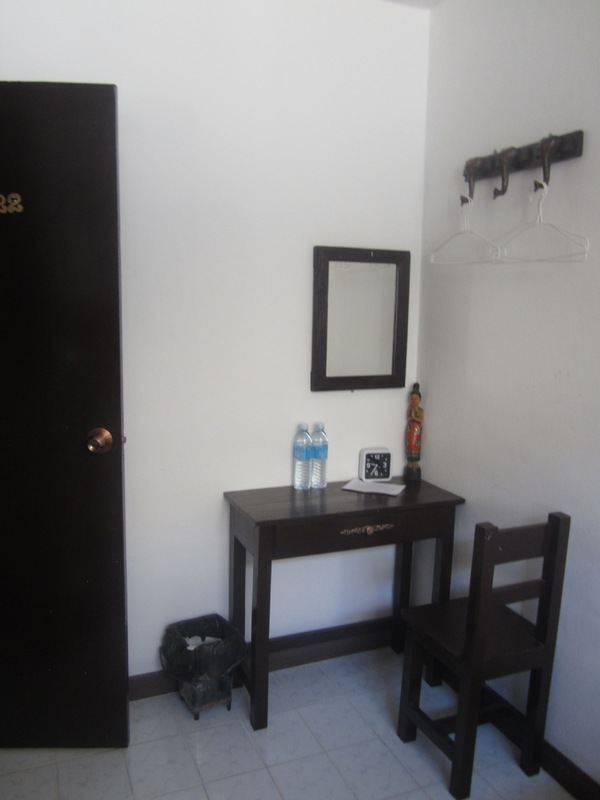 It is a 15 minute walk to the airport and a very good price. We paid $25 for one night. The other great thing about this hostel is that there is a 7-11 just around the corner and it is open 24 hours. I highly recommend this hostel if you have a layover in Bangkok or if you have an early morning flight from Don Mueng airport. Upon leaving Phnom Penh, Glenn and I were really ready for a beach. 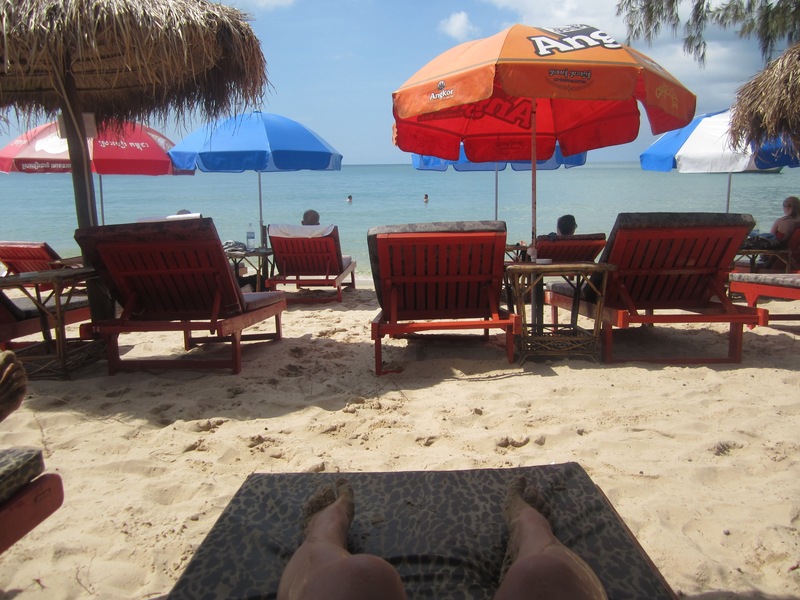 I know what you are probably thinking, does Cambodia have beaches? The answer is yes! 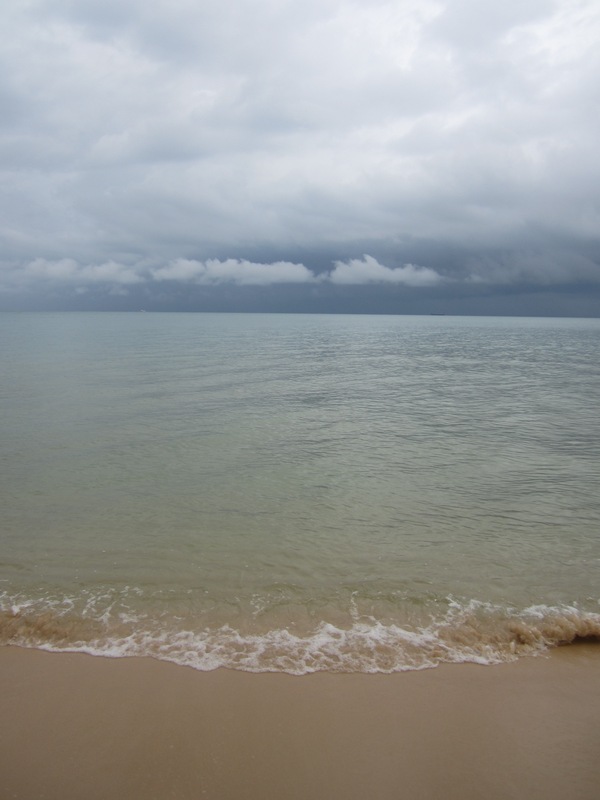 Cambodia has some truly amazing beaches. 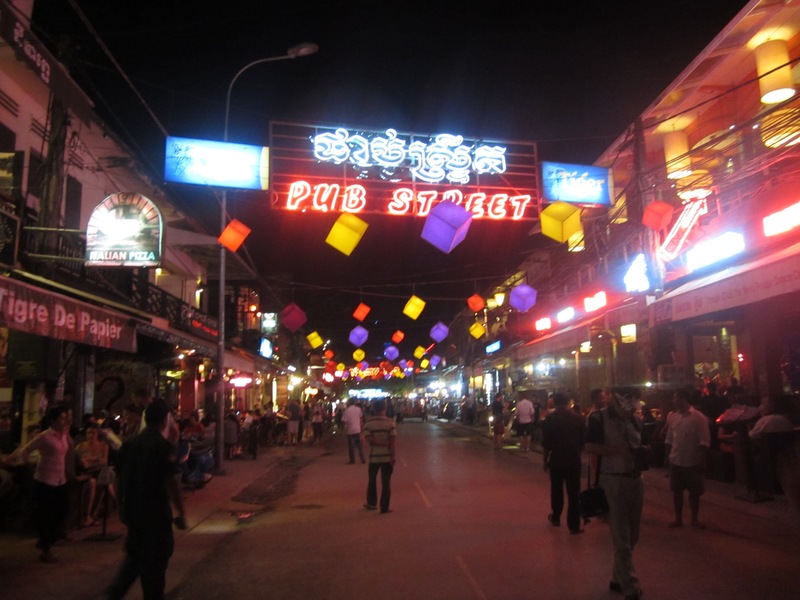 So we took a bus south to the town of Sihanoukville on the coast. 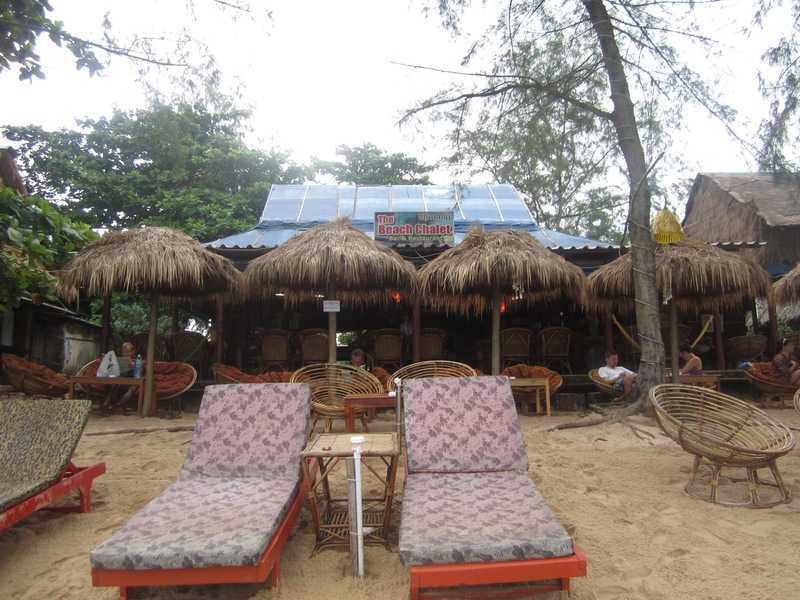 The easiest and cheapest way to get to Sihanoukville from within Cambodia is to take a bus. Our hotel in Phnom Penh arranged this bus for us. From Phnom Penh the trip took about 5 hours. The buses have air conditioning and ours actually had working wifi and a toilet so the trip was very comfortable. 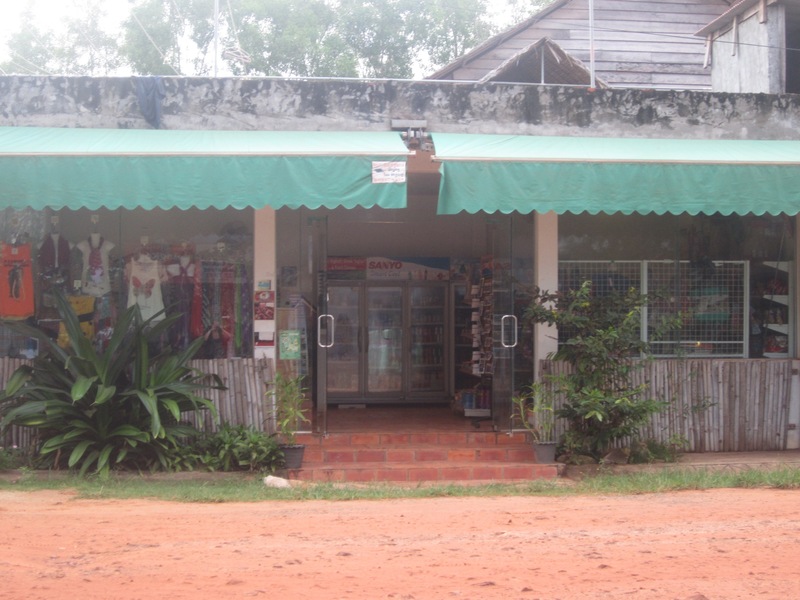 You will arrive at the Sihanoukville ‘bus station’ (really a glorified parking lot with a few food stands around it). Plenty of tuk tuk drivers will be waiting to take. You to your hotel or into town. It is too far to walk so you will have to take a tuk tuk. There are also usually a few representatives from the area’s hostels advertising available rooms if you have not booked in advance. 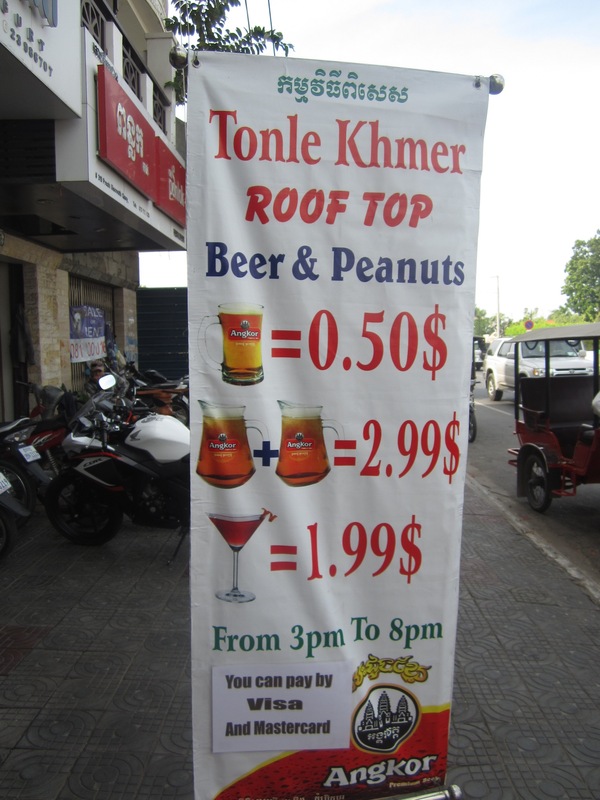 If you are outside of Cambodia and would like to visit this area or if you simply want to avoid a bus trip, Sihanoukville does have an airport. However, remember, because it is a smaller and less trafficked airport the prices will be much higher. For this city we did not book a hotel in advance but we had done a bit of research and googling in advance. 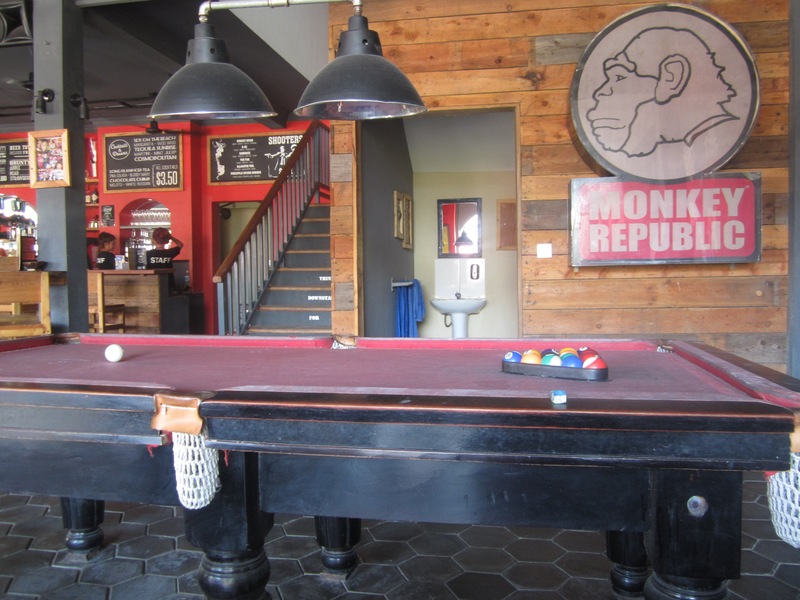 We had come across Monkey Republic, it sounded great so we decided to go there first. If it was good we would stay and if not we would keep looking. It was great. 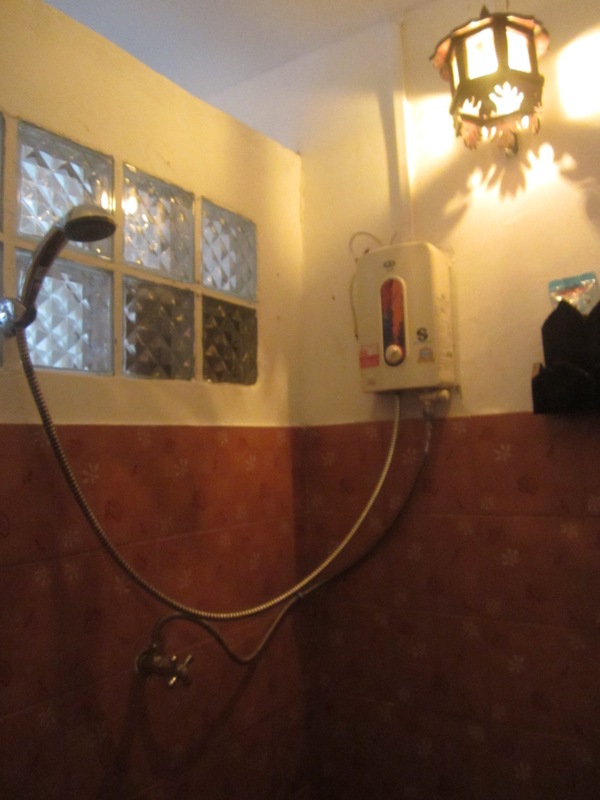 This hostel has recently been completely redone. The rooms are very clean and comfortable. Dorms were $5 plans double rooms were $10 per room. Since it was the same price we got a double room. 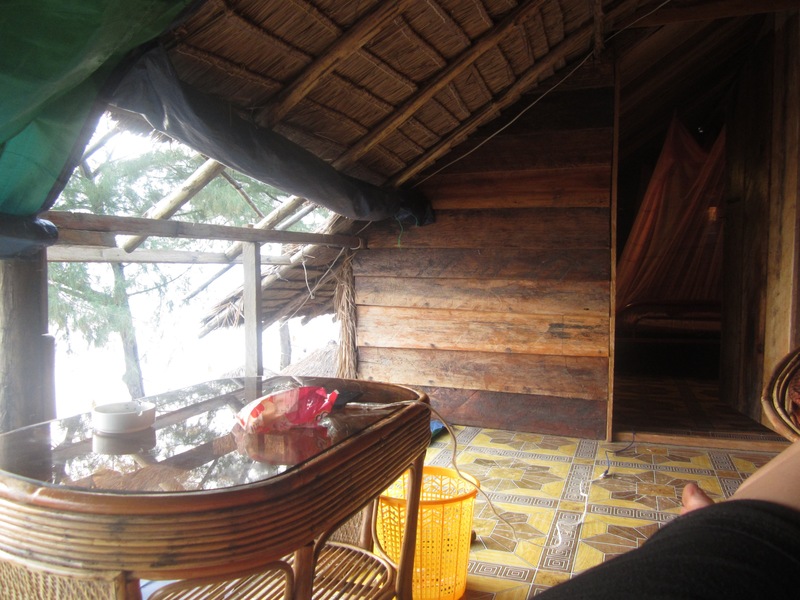 The rooms are not air conditioned but there is a fan and the room is open (with screens) at the roof line so the too. 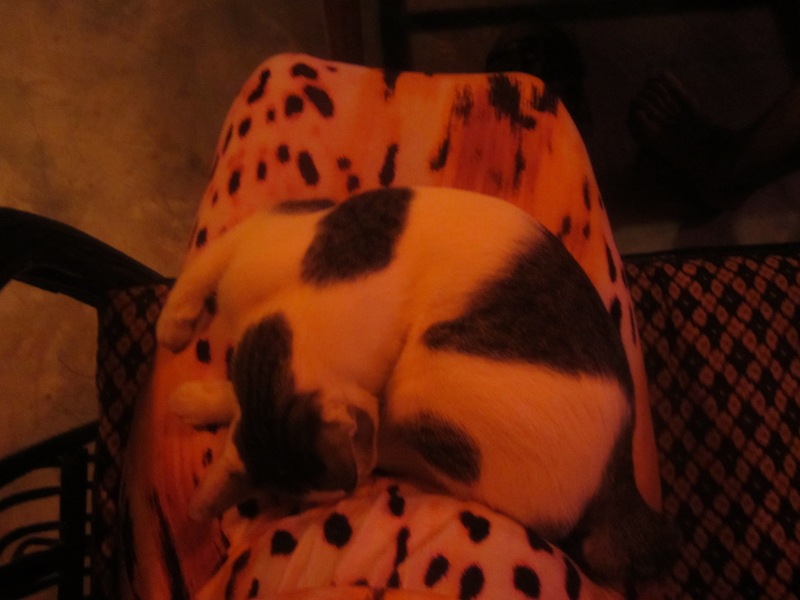 Was a very comfortable temperature at night. A funny, though important thing to note. The plumbing systems in this area of the world are not terribly powerful and cannot handle toilet paper so our bathroom has this lovely sin as a reminder of what could go in the toilet and what could not. We found it very funny. 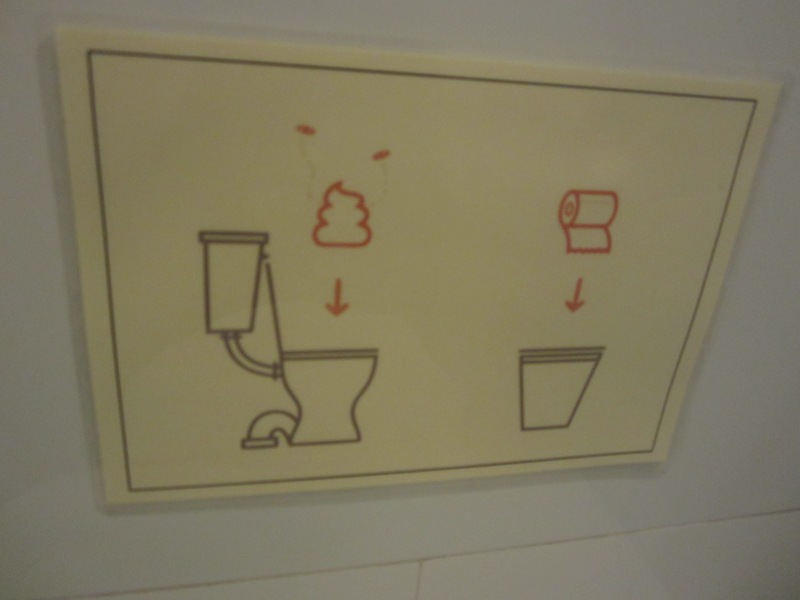 It is important though because you do not want to have a toilet overflow on your vacation, just not fun. 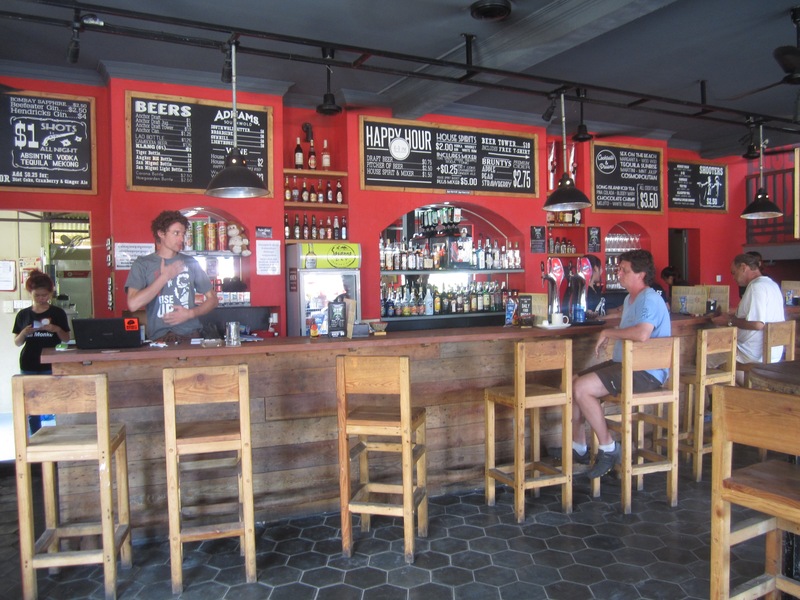 The hostel also has a great restaurant/bar/common area. Downstairs is a louder bar area. Upstairs is a quiet lounge area with a nice balcony and comfy seats. 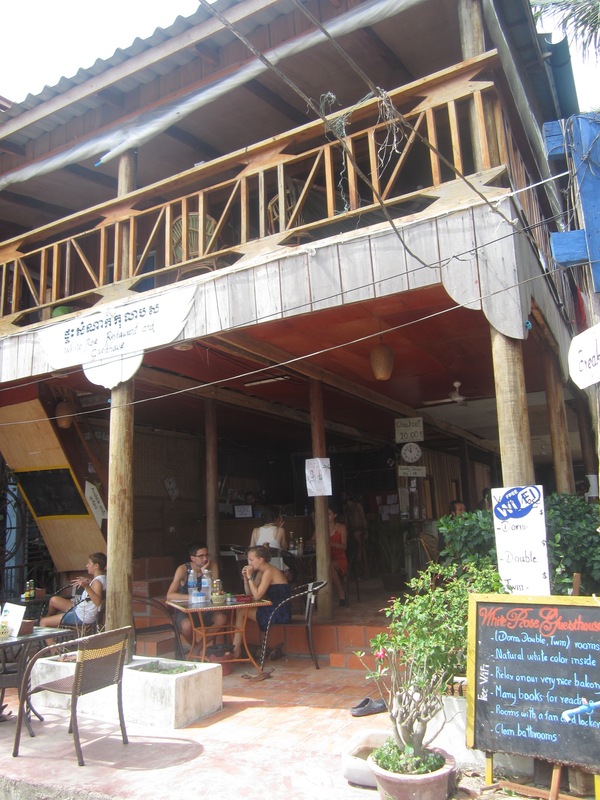 The hostel location is great, right on the Main Street of the beach area of Sihanoukville, near many restaurants and other hostels. It is about a 10 minute walk down to the pier and the beach. 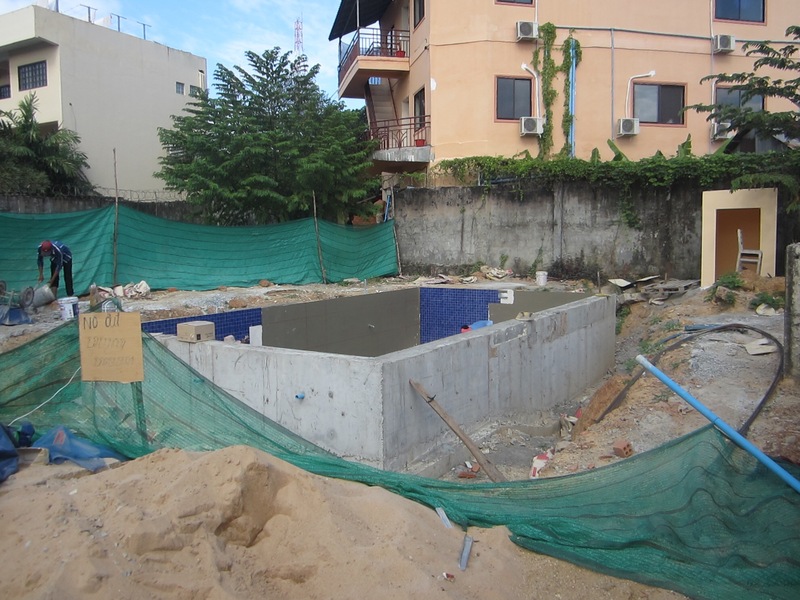 In just a few months (maybe less) this hostel will be even better as we saw them about halfway finished with putting in a built in pool! Note: is will likely increase the price of the rooms, but I think it is probably worth the few extra dollars. Here is the pool as of mid November. 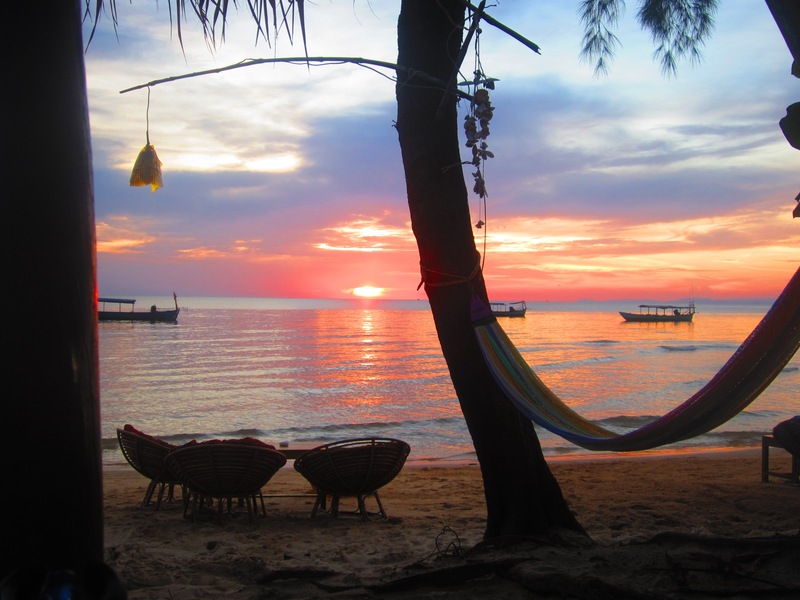 When staying in Sihanoukville, there are two main beaches you will visit: Serendipity and Ochheuteal. In reality these two beaches are one long stretch of sidewalk with beach on one side and restaurants on the other and I have no idea where one ended and the next began. In my opinion these are not the best beaches for sunbathing an relaxing. They are crowded, not very clean and there are beach vendors everywhere constantly asking you to buy bracelets or sarongs or food. (For quieter relaxing beach time go to Otres beach – see further in this post). 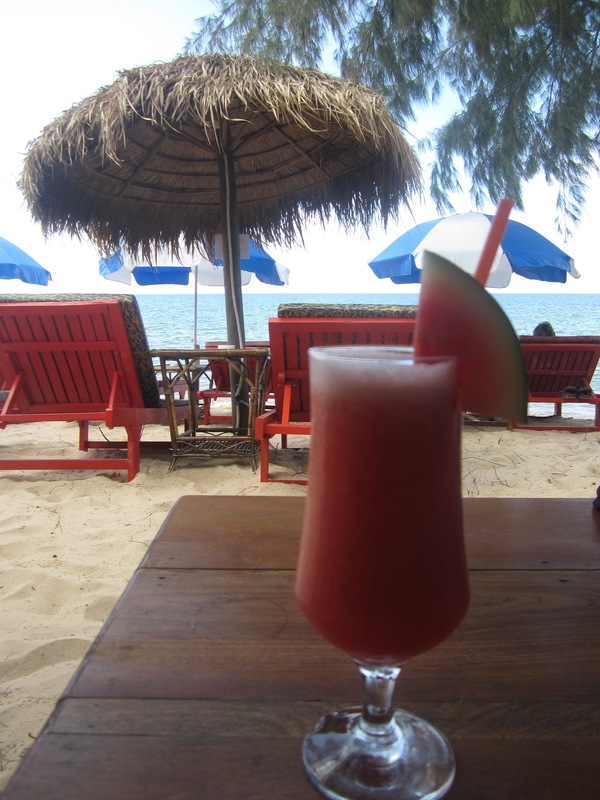 However, these beaches are excellent for enjoying food and drinks at the restaurants and for the nightlife after dark. 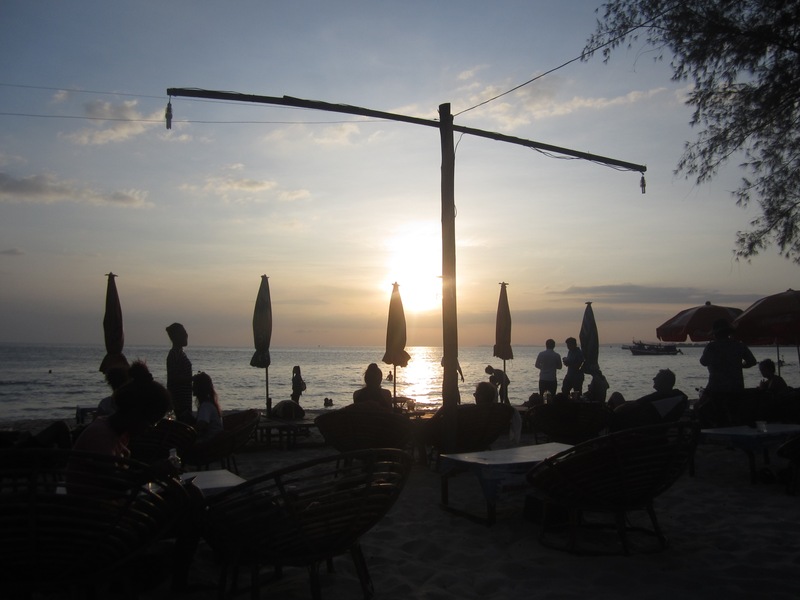 The restaurants are also the perfect place to sit and watch the sunset. 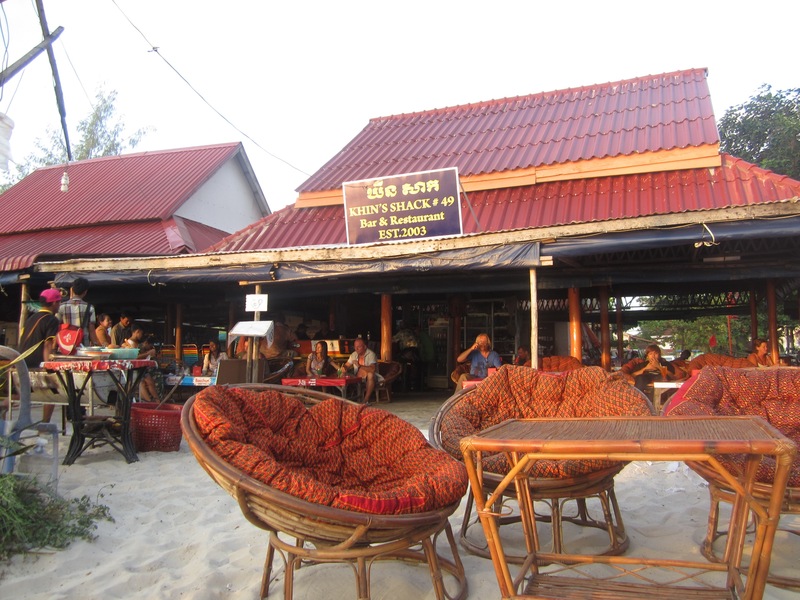 Our favorite restaurant in Sihanoukville by far was Khin’s Shack. This restaurant is at the far end of the beach. 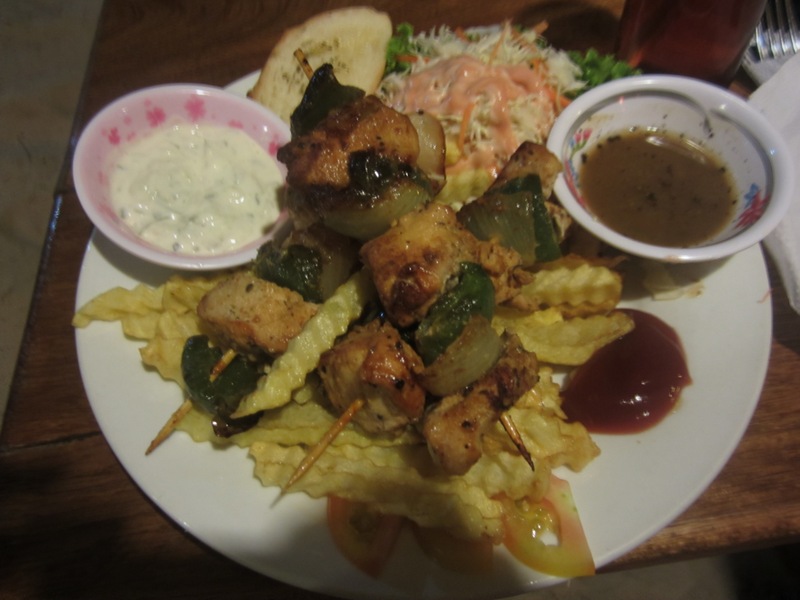 They have an extensive menu, excellent food, great prices and really friendly service. It was so good that we kept going back and actually ate there several times. 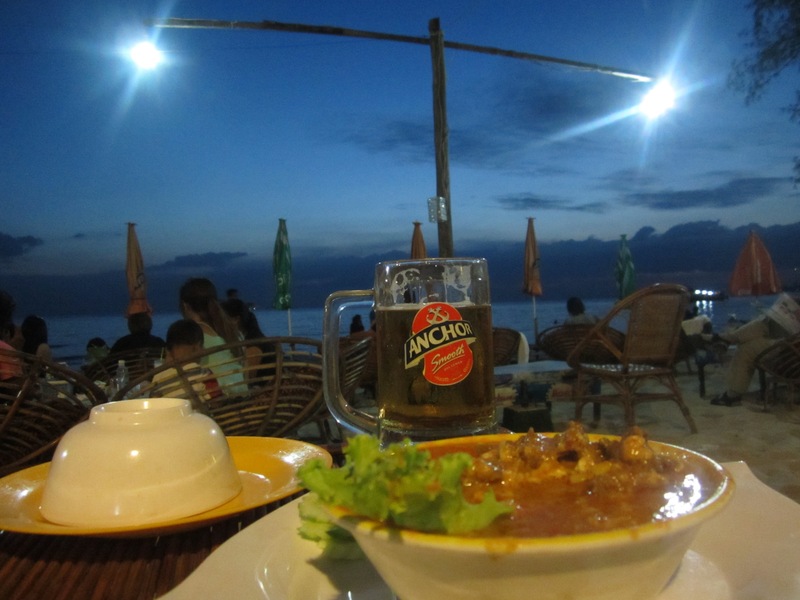 One evening we ordered two kinds of Amok (Cambodia’s national dish), one shrimp and one beef. Excellent and so chock full of meat! 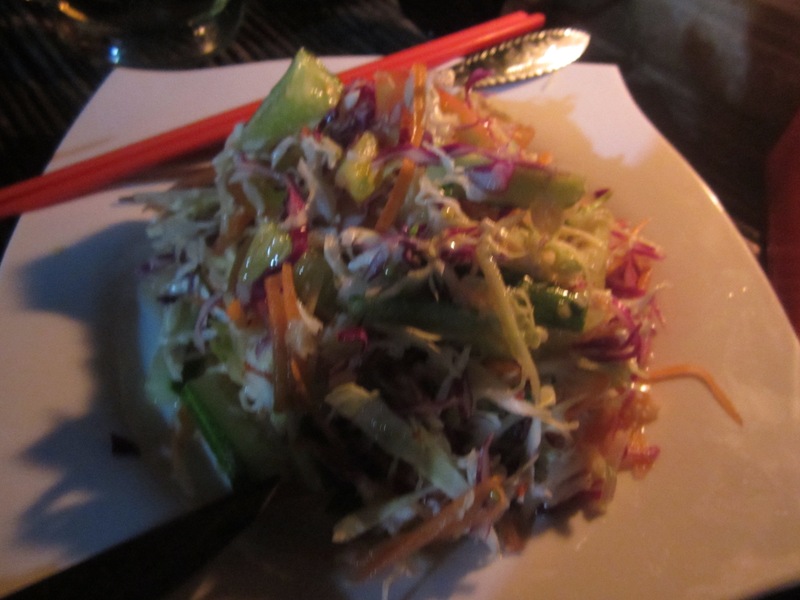 Another night we ordered grilled scallops, barracuda and a spicy cabbage salad. This dinner was even more amazing! 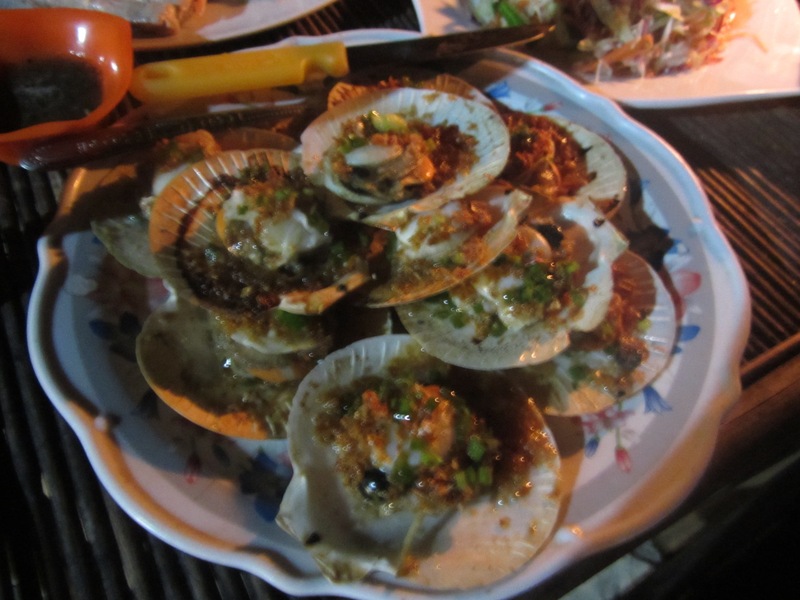 So fresh and the price makes it even better, for example we got 11 fresh grilled scallops for only $2! 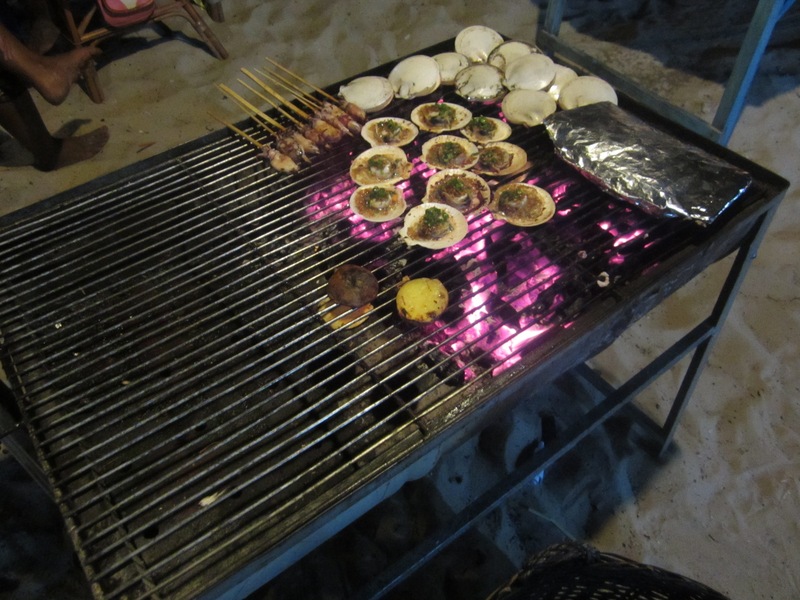 Here is a great picture of the scallops on the grill. 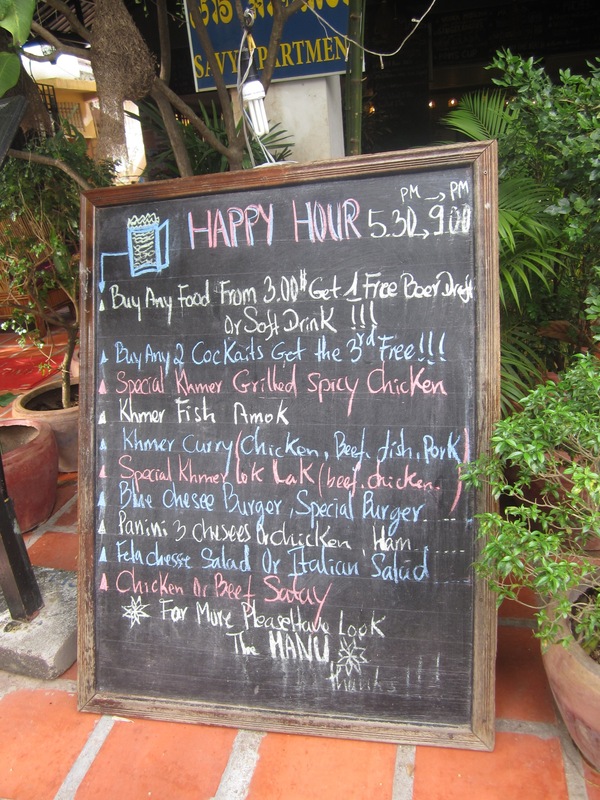 In addition to the amazing food, the also offer a fairly extensive “happy menu” if that is some this you are interested in. Now, this is not a copy of the McDonalds happy meal. 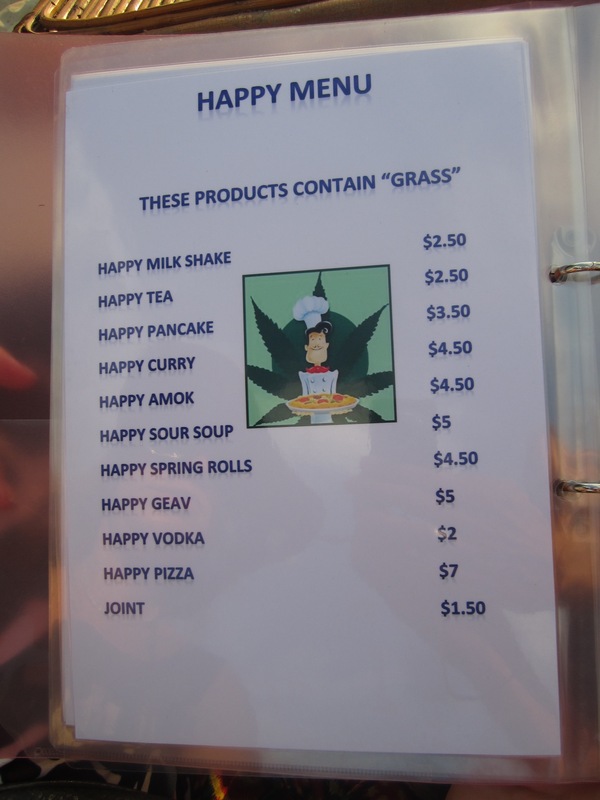 In Cambodia (and really many places in SE Asia, ‘happy’ food and drink means it has pot in it. Be careful that you don’t order something like this by accident. 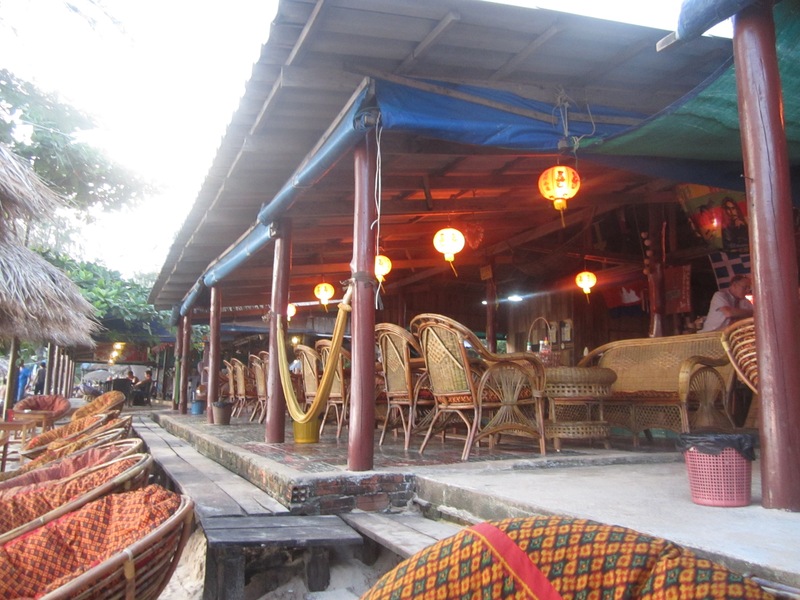 There is not all that much to do in Sihanoukville besides beach related activities, but there are several shops around town selling handicrafts, paintings, beach accessories etc. You can also find several tattoo parlors around town, this is a popular thing for many tourists to do when they visit Asia. 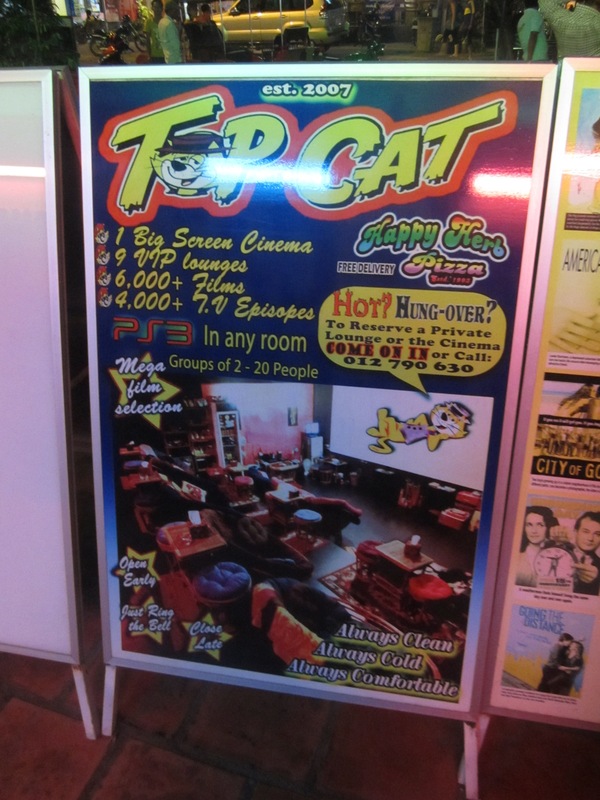 If you need a break from the heat I recommend heading over to Top Cat Cinema. Here you can either rent a private cinema or during the high season (December through March) you can see movies in the main theatre. It is fully air conditioned and has thousands of movies to choose from. Another great thing to do for the day is to rent a scooter. We rented one for a full 24 hours for about $7. It is. Great way to explore parts of the city a bit too far for walking distance. 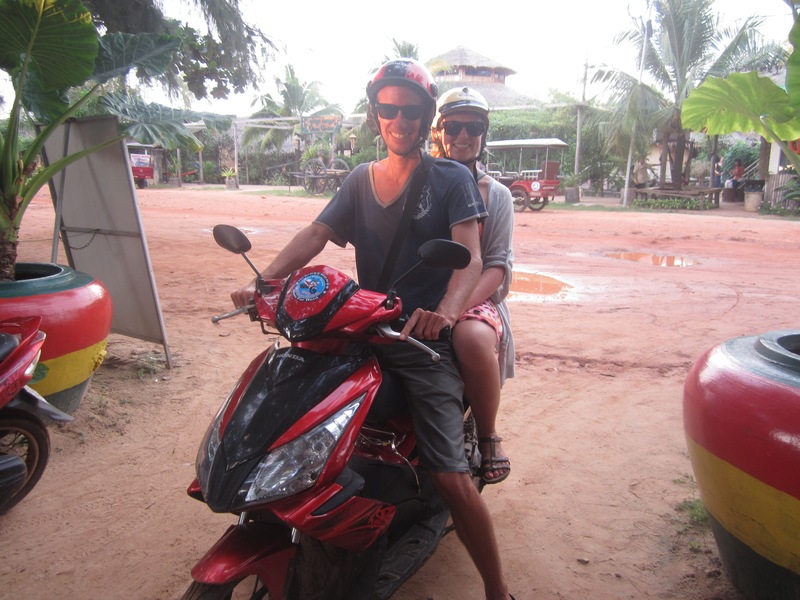 People drive really nicely and respectfully in the Sihanoukville area so it is even a good option for complete beginners. The local people are also incredibly nice and helpful. As we were driving somehow we ran out of gas. Within 2 minutes of us stopping to walk the bike to a service station 3 people had stopped to help us. 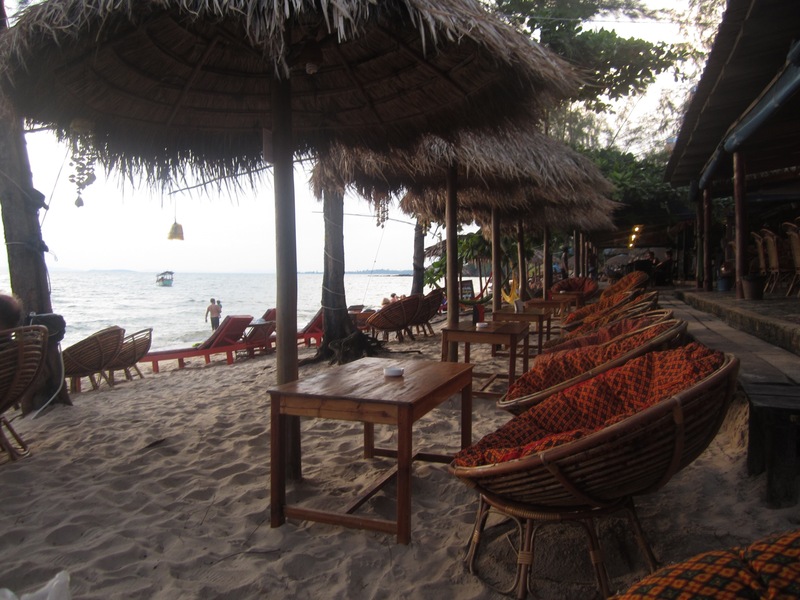 Otres beach is really only about 20ish minutes down the beach from Sihanoukville but it feels like it is worlds away. Otres beach is quiet and clean and relaxing. 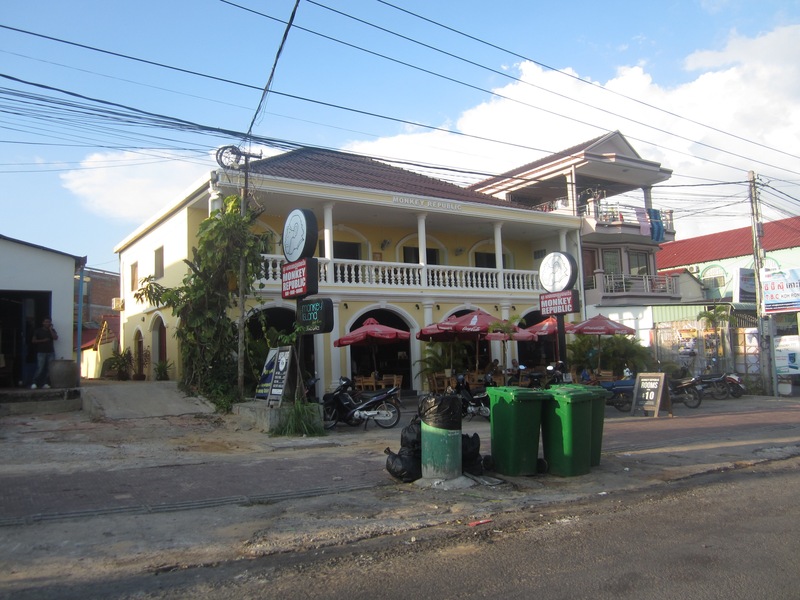 If you don’t have bags or only have small day pack sized backpacks you can just walk from Sihanoukville to Otres Beach. The entire walk will take about 30 minutes give or take. Simply follow the beach to the end. You will pass all of the restaurants of Serendipity and Ochheuteal beaches and the. You will pass a long undeveloped stretch of the beach. 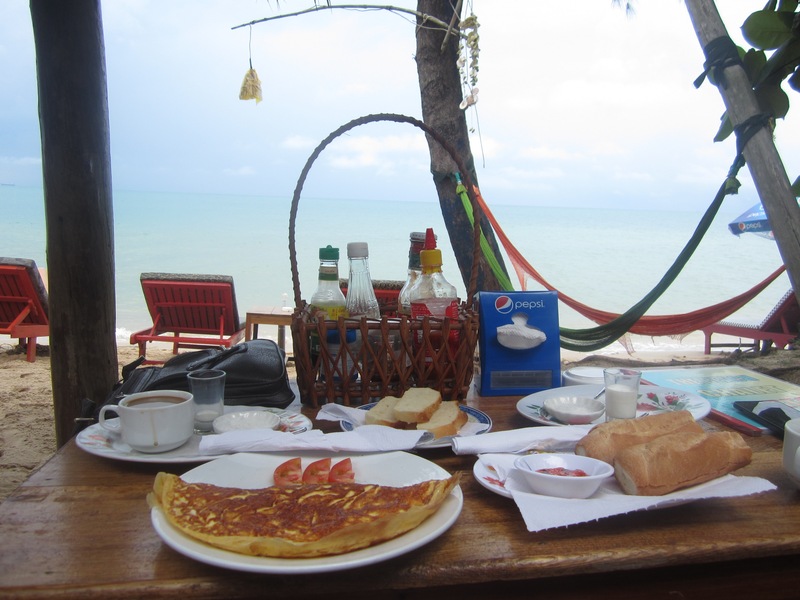 Then you will come to a small collection of a few restaurants and hotels at the end of the beach. From here walk on the road across a small bridge and up a hill. Go down the hill on the other side (down a set of stairs) and you have reached Otres beach1! Otres beach 2 is another 10 minute tuk tuk ride further. This sounds much more difficult that it actually is, you basically just walk straight. (Note: during the day this walk is fine but I do not recommend it at night. We noticed several locals squatting on the undeveloped land in the middle and it is completely empty of businesses and dark at night. Likely you will be fine but it is not worth the risk). If you have large bags just take a tuk tuk. It should only cost you max $5 or so and the ride is about 15 minutes. If they try to overcharge you just walk away, they usually call you back and accept the lower price. Otherwise just find a different tuk tuk. They are all over. We found the best hotel on Otres Beach! Ok actually they all look great and you can find something to fit your personality and budget. 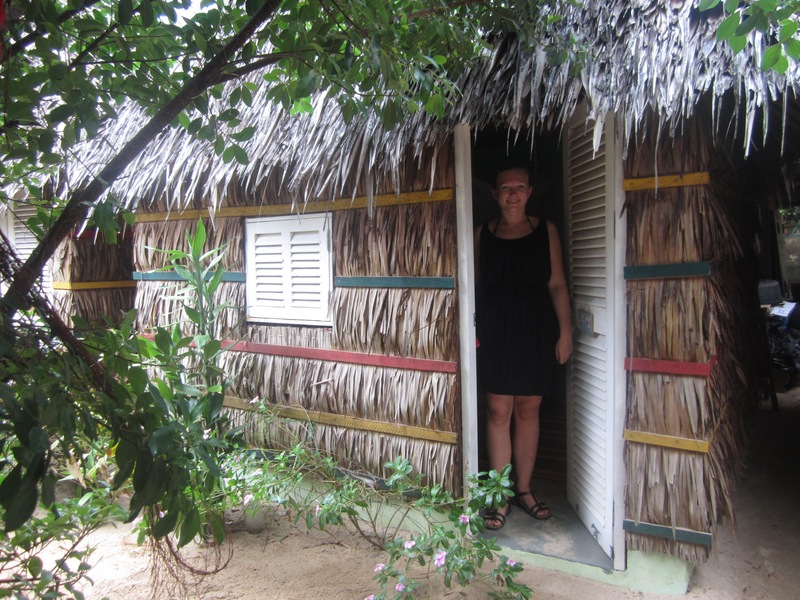 For us the perfect hotel was The Beach Chalet. It is about halfway along Otres Beach. They have 7 bungalows and one room upstairs. All rooms have a double bed and some storage shelves. 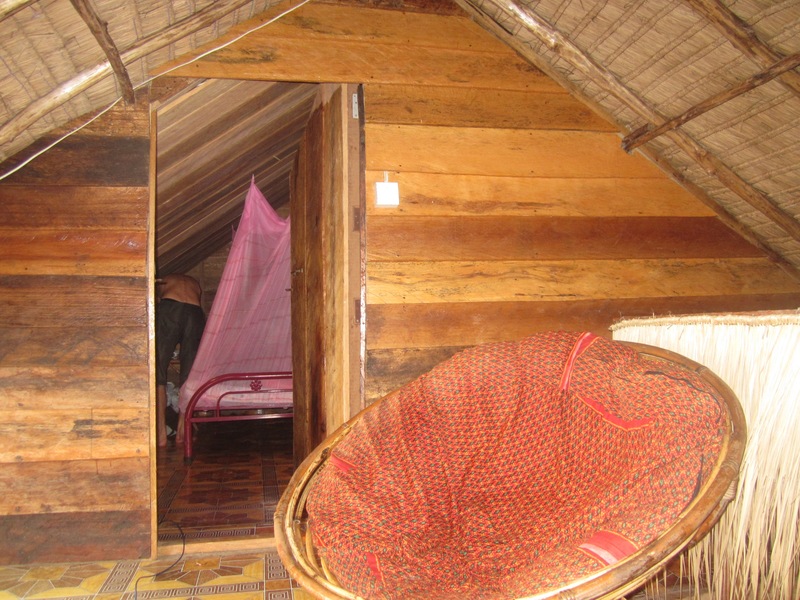 The rooms also have mosquito nets and fans. 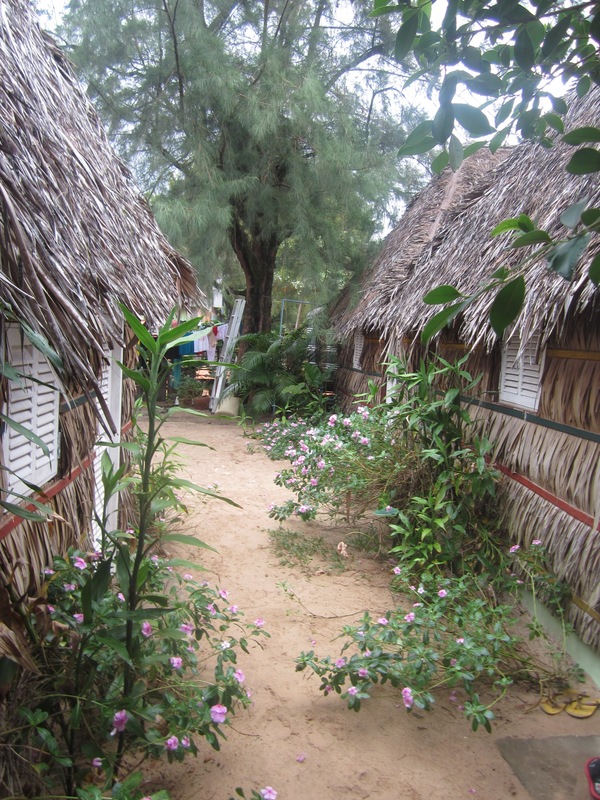 The Beach Chalet also has excellent reliable wifi. The Beach Chalet is owned by two wonderful middle aged Greek gentlemen, definitely take some time to hang out with them during your stay. Across the street is a great little store that sells snacks, drinks, souvenirs and other things you might need. Very convenient. 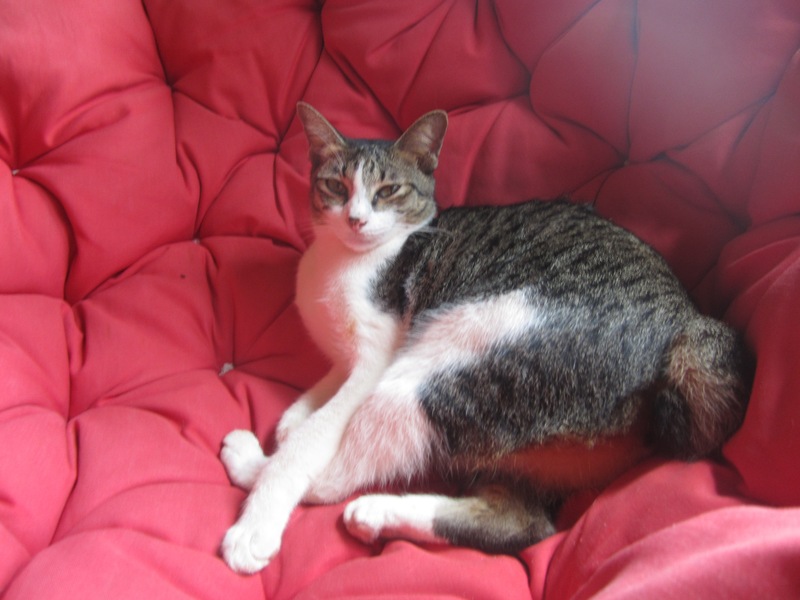 There are also two lovely cats that have adopted The Beach Chalet as their home. They are very sweet and will happily keep you company. They are very calm and very clean. 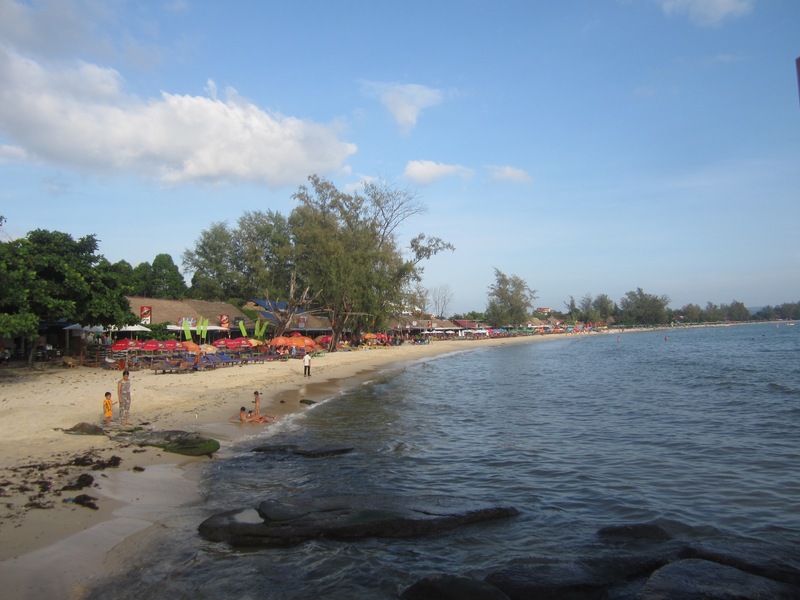 Otres beach is much quieter than the beaches of Sihanoukville. 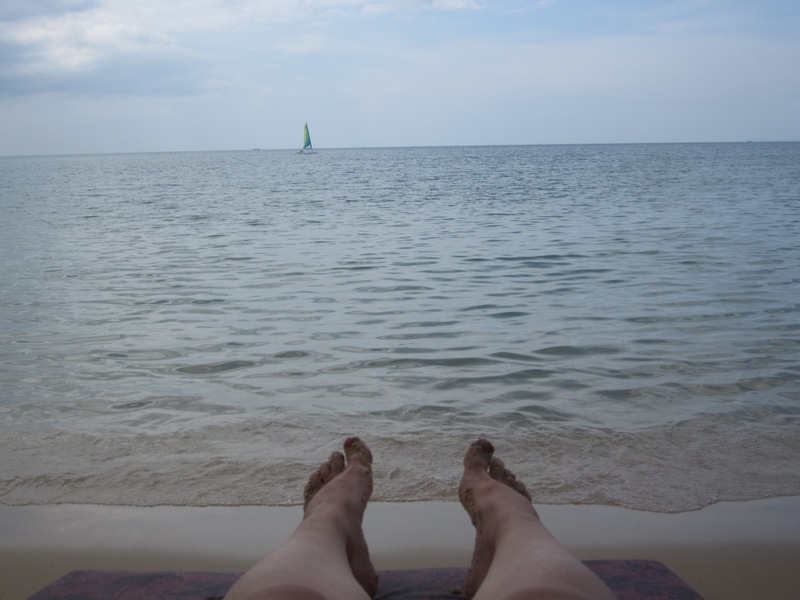 This is the best place to be if you want to relax and just enjoy the quiet of the beach and the sound of the ocean. The Beach Chalet has both chairs and loungers available. All along the beach the different restaurants and hotels have similar seating but The Beach Chalet’s cushions and chairs are newer and in better condition than many of the other places. 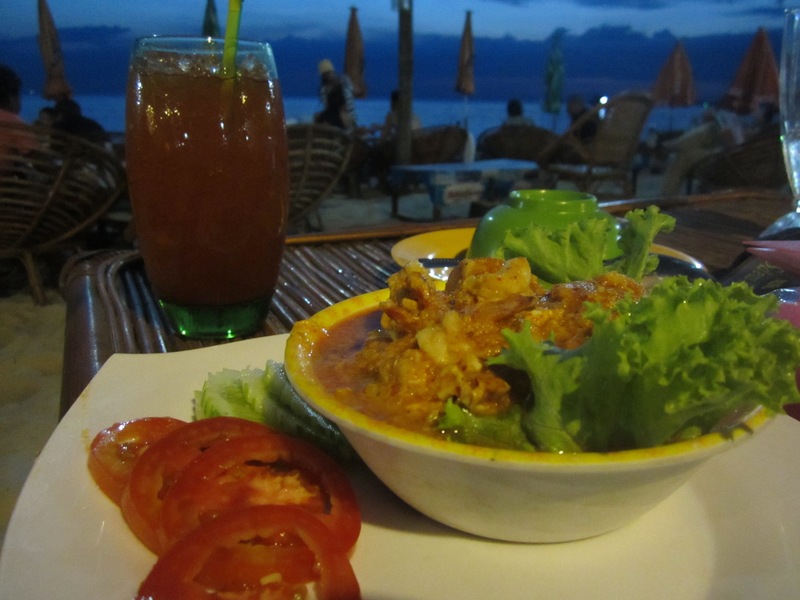 Most days we ate at our hotel The Beach Chalet because it was convenient and excellent food. Most mornings we ordered 1 baguette with butter and jam and 1 ham and cheese omelet and split them. And we would also usually order coffee and fresh fruit shakes. Our hotel offered mango, papaya, pineapple, coconut, and watermelon. They were all amazing. 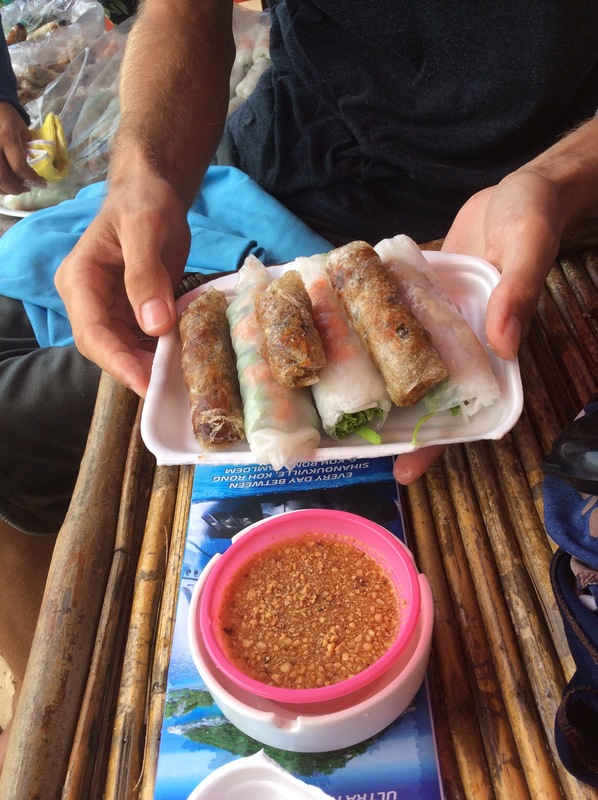 Because the owners of The Beach Chalet are from Greece, they have a few amazing Greek dishes in addition to the many Cambodian dishes they serve. If you stay here you MUST order the chicken souvlaki at least once. 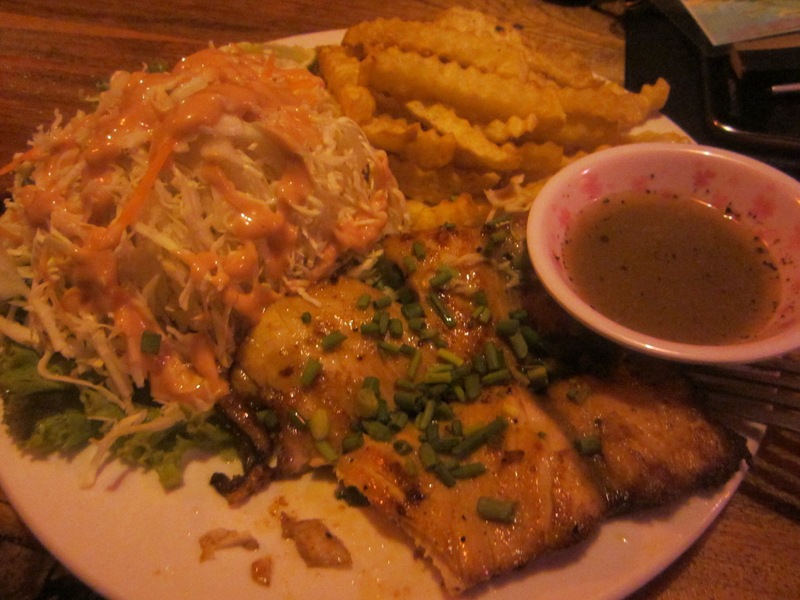 It is a $1-2 more expensive that the rest of the dishes on the menu but it is worth it. 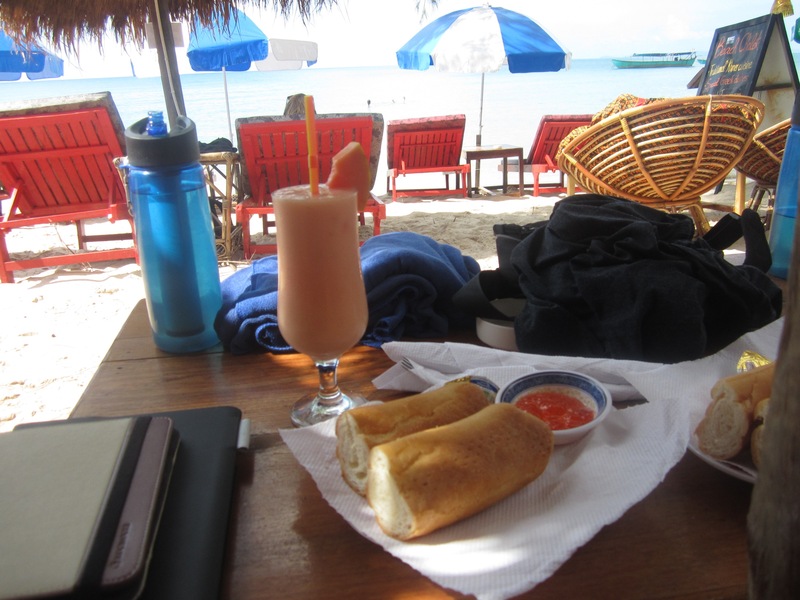 I can also highly recommend the barracuda at The Beach Chalet. So delicious. 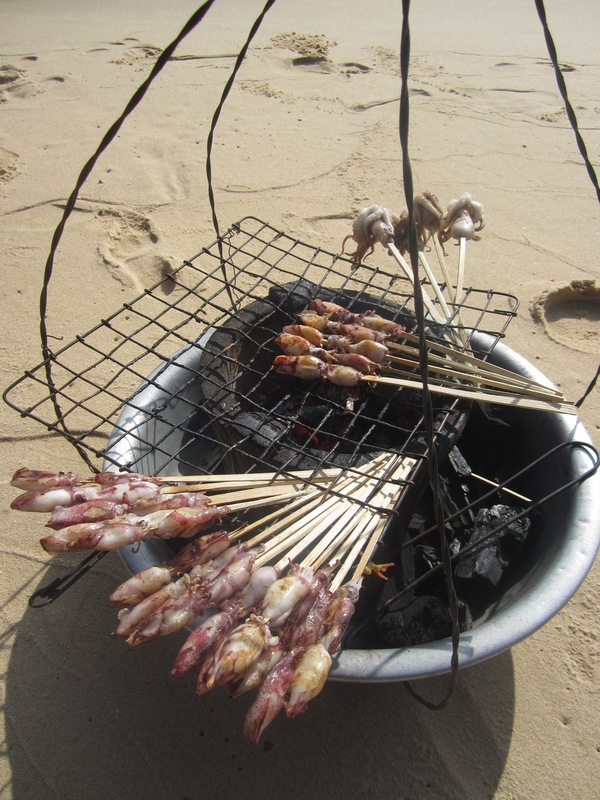 Some of the best food we had at Otres Beach was actually the ‘beach food’. 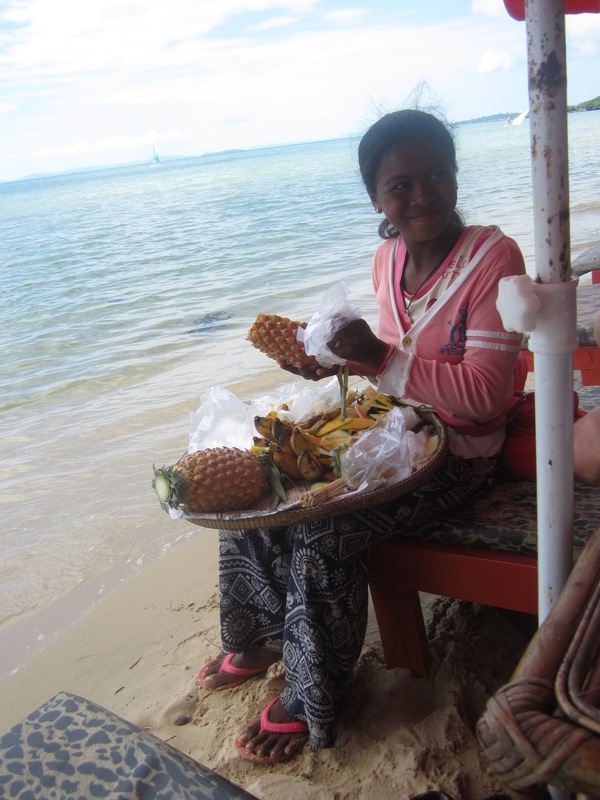 This is the food that ladies sell walking up and down the beach. We also treated ourselves to some truly excellent Italian pizza. At the far end of Otres 1 is a hotel named Papa Pippo. The owners are from Italy and the pizza is amazing. Definitely a must try. Koh Rong is an island off the coast of Sihanoukville. 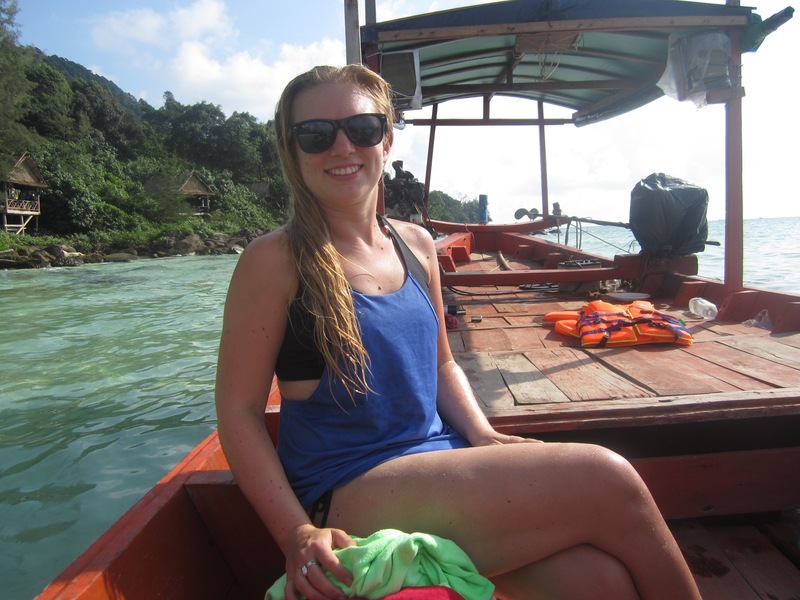 To get to Koh Rong you take about a 1 hour ferry ride. 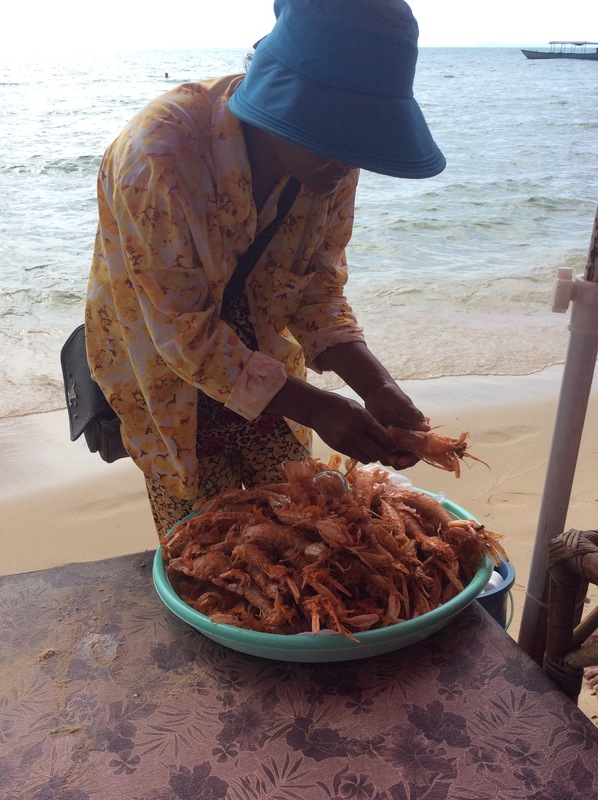 Ferry tickets are $10 each way and can be bought at most hotels and at the many tour operator offices in Sihanoukville and Otres Beach. When you arrive at the island the ferry docks at the pier at the main village. Beyond the pier is a stretch of hotels and restaurants in both directions. 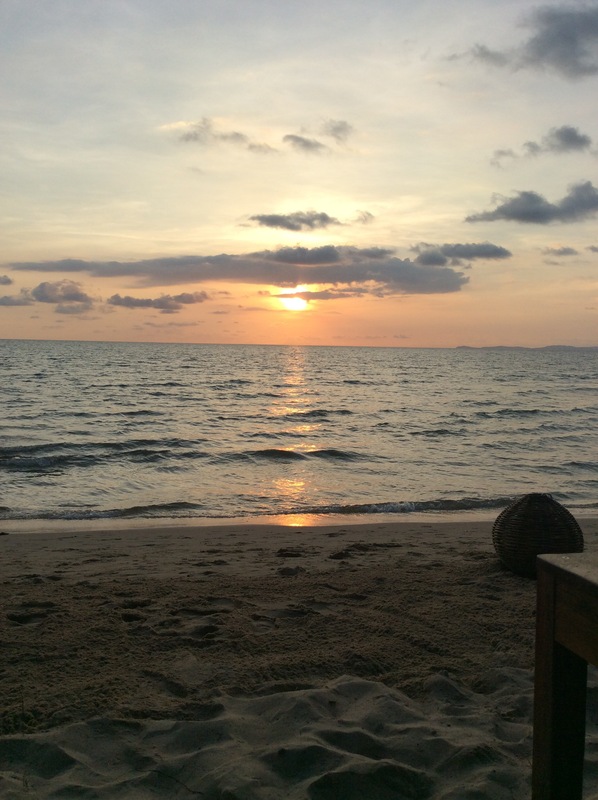 There are many hotels to choose from on Koh Rong, basically all in the same place so it almost does not matter which one you choose. We stayed two nights at The White Rose for $15 per night. Nice comfortable rooms with mosquito net and fan. 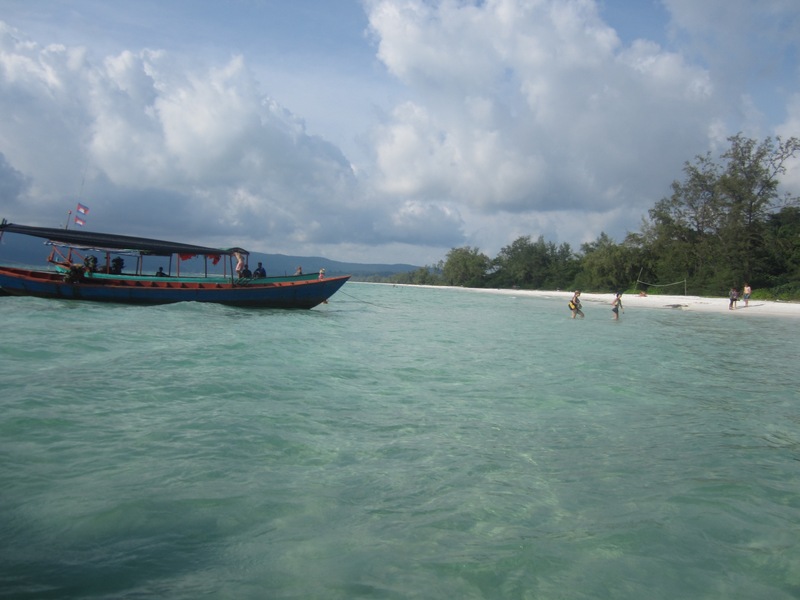 A lot of growth is happening on Koh Rong. A couple we met this year had also visited last year and they told us that the number of hotels has doubled since last year. We also learned that interestingly many of the businesses are owned by Russians. If you walk along the village to the end (only about 10 minutes, it is a small village) you will reach the beach. I was not impressed by this beach. I felt that it was small, crowded and not too clean (compared with Otres beach). Most people there seemed to love it though so maybe I am over critical. 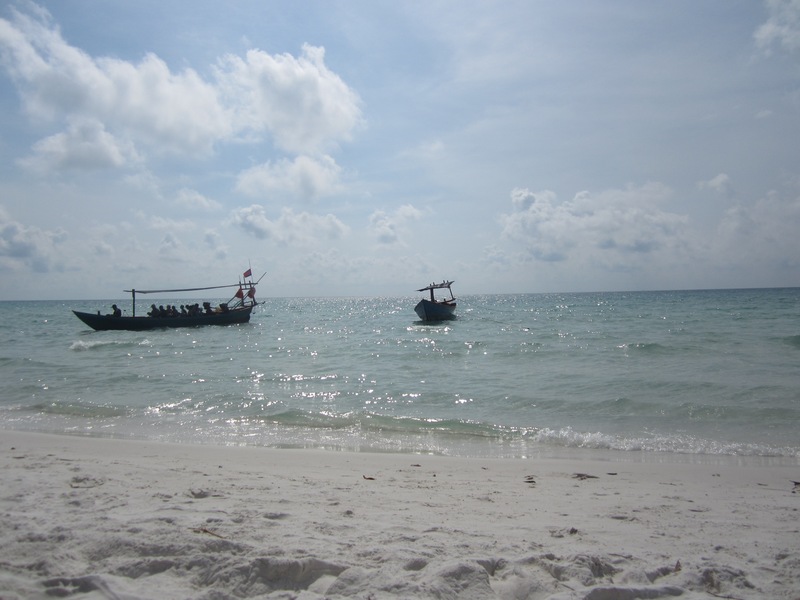 The best beach on Koh Rong is Long Beach, a secluded beach on the other side of the island from the main village. To get to it you mKe a 45 minute trek through the jungle, up and over the island. Be sure to wear proper clothes for this trek. There are roots and the ground is uneven so sneakers are the best footwear. It is the jungle so there are more insects than on the beach so the more covered you are the better. Of course it is also incredibly hot (30 degrees Celsius average) so you have to find a balance. 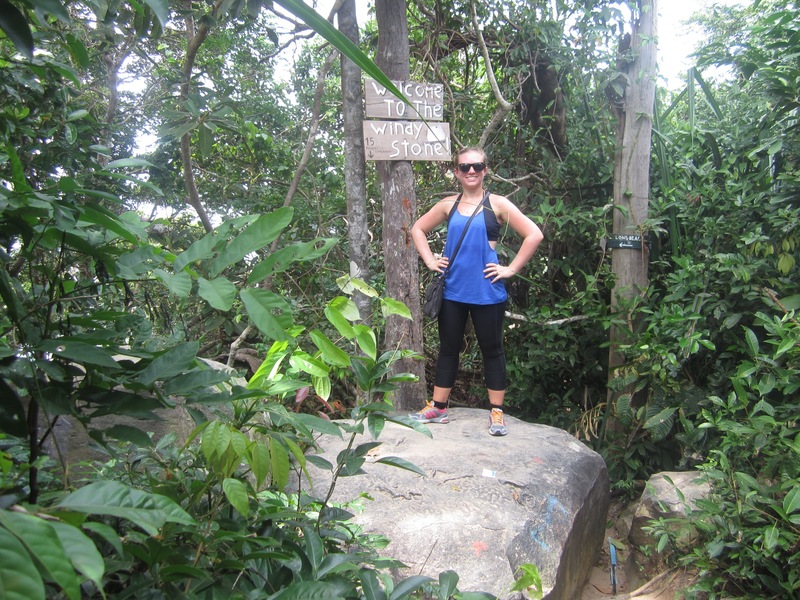 I was comfortable in spandex capris and an athletic tank (with a bikini underneath of course). Also be sure to have your sunglasses, water and bug spray. Actually, we learned that coconut oil was even more effective than bug spray and better for your skin. Just cover all exposed skin with the coconut oil and you should not get any bug bites. The beach is beautiful and well worth the trek. Be sure to stay covered in coconut oil and reapply after going in the ocean because the beach is full of sand flies and many people get badly bitten. We kept reapplying the oil and were not bitten at all so it is effective. If trekking through the jungle is not your thing but you are still interested in visiting this beach you can take a boat either to the beach or back to town for about $3 per person each way. We decided to take the boat back to town. Long beach is also an excellent place to watch the sunset. We did not do this but it is one of the most popular activities on the island. 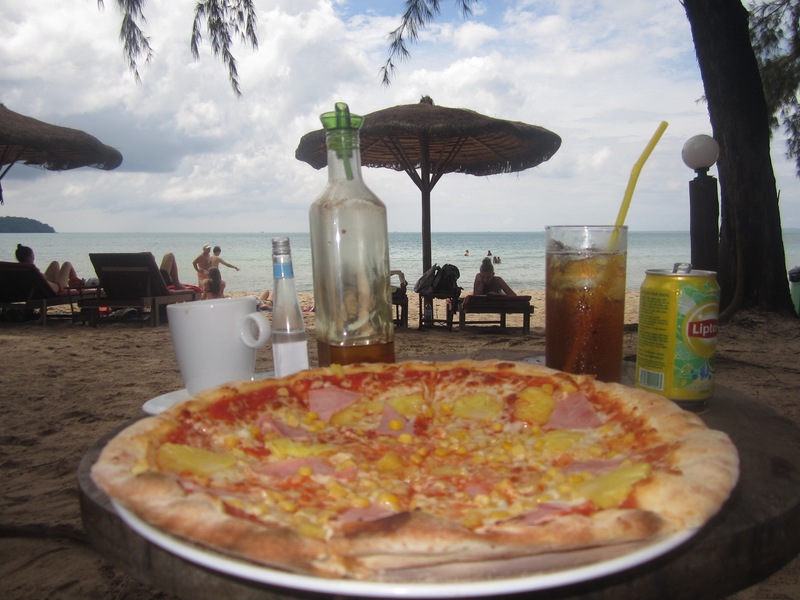 There are many places to eat on Koh Rong in the village but we actually at both days at our hotel The White Rose because any food purchase came with a free beer which was a better use of our money. 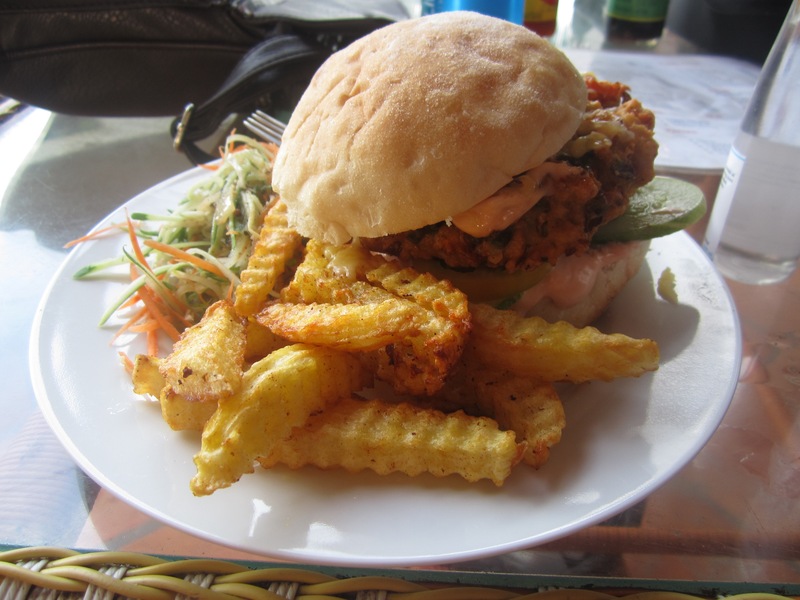 I highly recommend the veggie burger. So amazing! 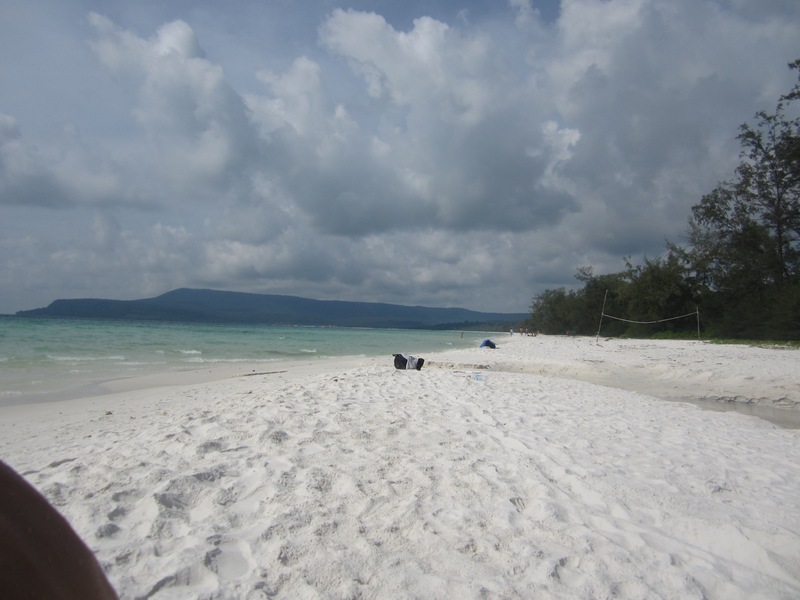 Koh Rong is one of the most popular destinations for people visiting the beaches of Cambodia and most people love it but for Glenn and I it just missed the mark. We had expected a secluded, quiet tropical island but found a crowded party island full of construction projects. 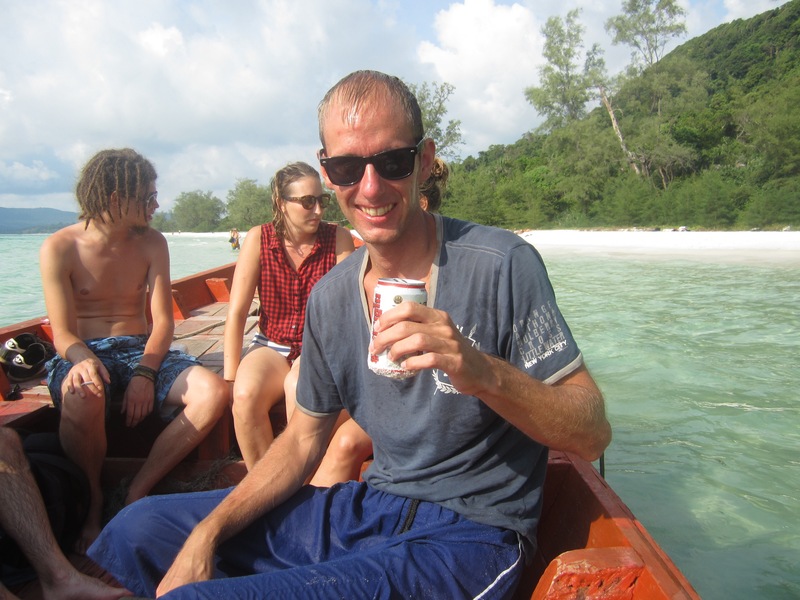 I think Koh Rong could be a lot of fun if you are a traveler looking to stay out all night drinking at beach parties and then sleeping all day on a crowded beach and meeting new random people everyday. However, it is not the best destination for a couple looking for a tropical getaway. Ironically, Otres Beach on the mainland was better for a relaxing tropical getaway. It all boils down to what kind of vacation you are looking for. 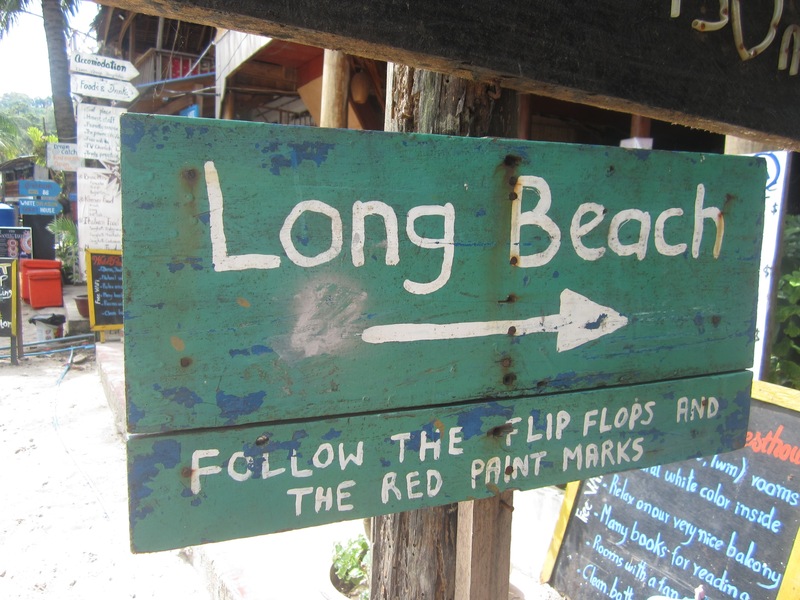 Either way, no matter what you are looking for, you can find it at one of the beaches of Cambodia. Phnom Penh is the capital city of Cambodia. 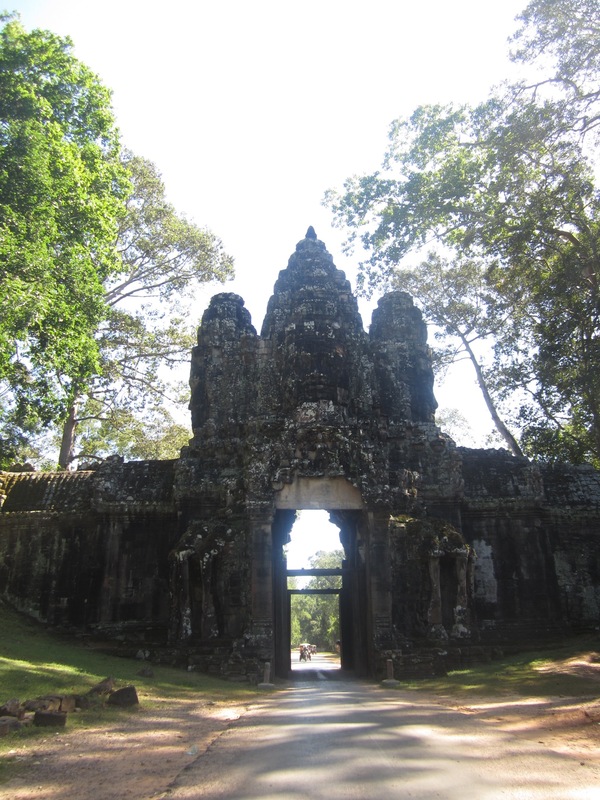 They do have an airport, though I recommend taking a bus if you are coming from Siem Reap because that allows you to see the countryside and rural villages of Cambodia you would otherwise miss. See my previous post to learn about the bus ride. 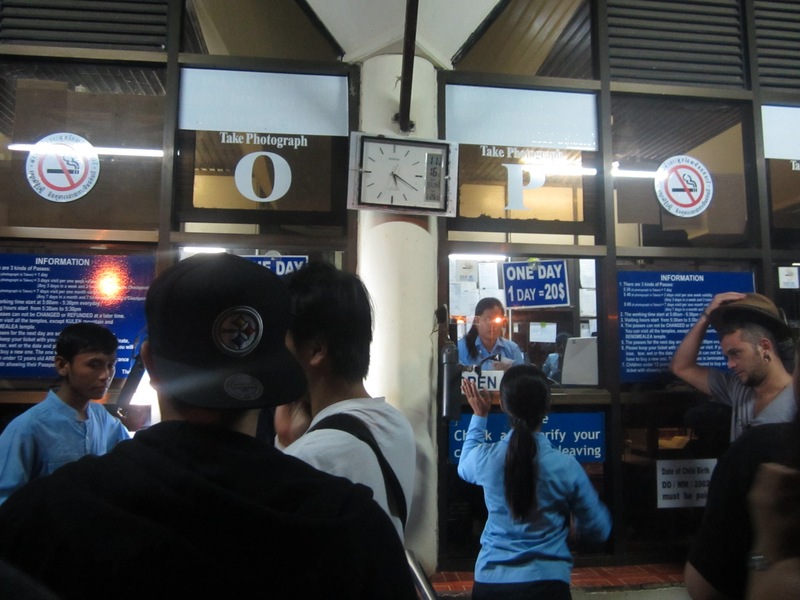 When you arrive by bus you will be dropped off at the bus station just across the street from the central market. 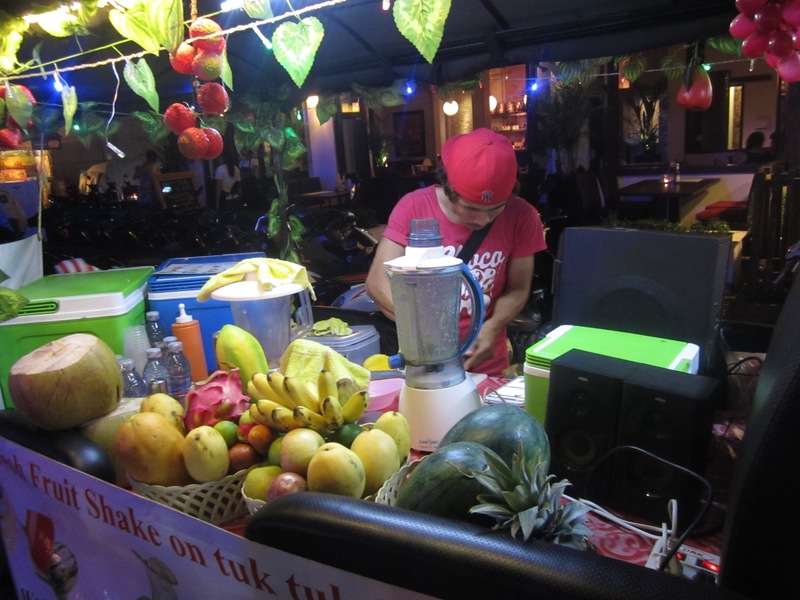 There will be people everywhere and many tuk tuks trying to get your business. 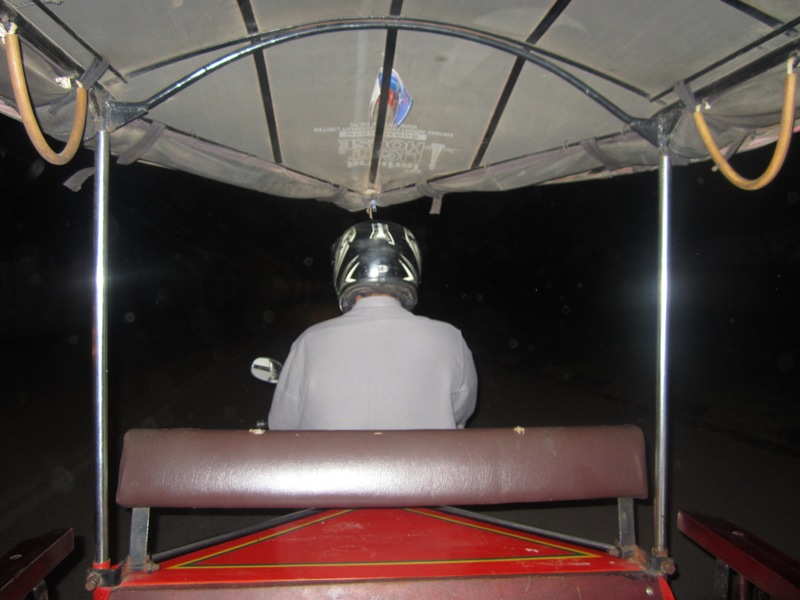 Tuk tuks are the best way to get to your hotel but be sure to set the price before you get in, they will often try to overcharge you. We found an excellent hostel in Phnom Penh on Agoda.com This hostel was in a nice neighborhood, just a few minutes from the river and near many nice restaurants. The room was clean. Air conditioning was available but the room is cheaper if you just have a fan. 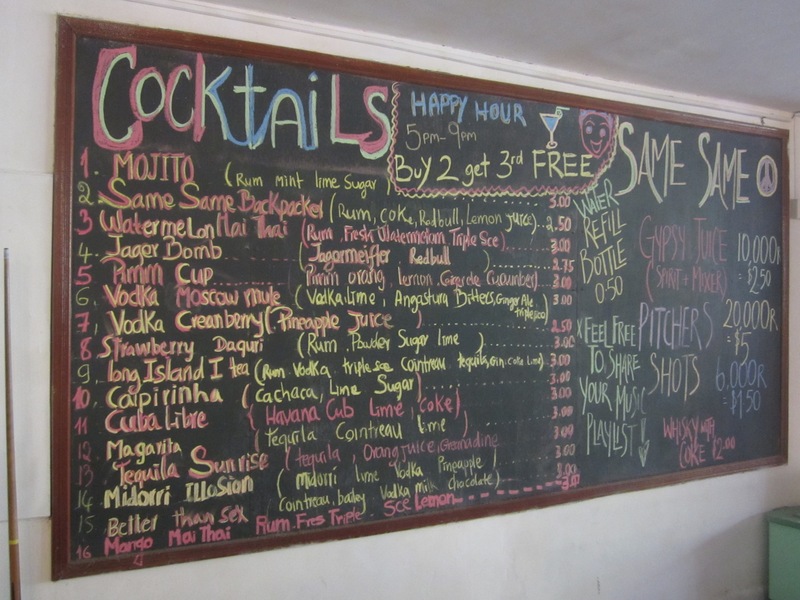 Here are some of the services the hostel can assist you with. 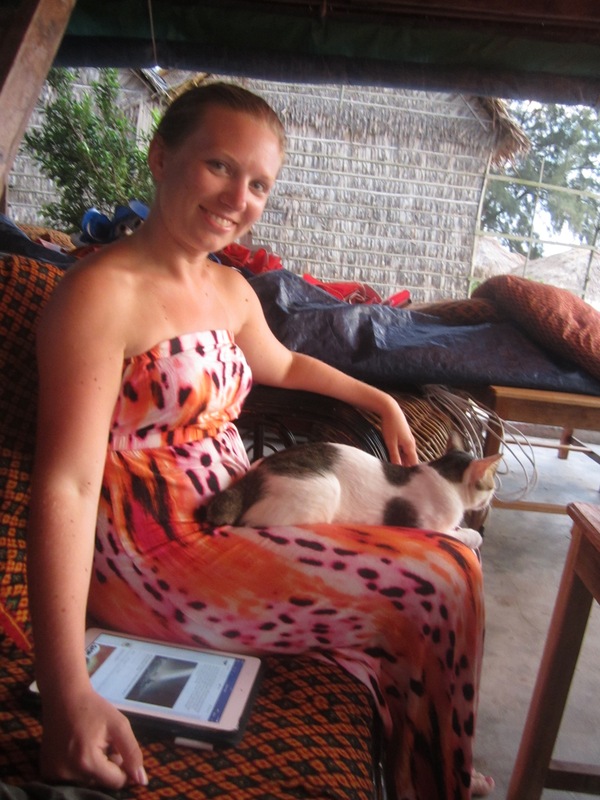 They will even help you with the processing of your Vietnam visa if that is where you are going next. 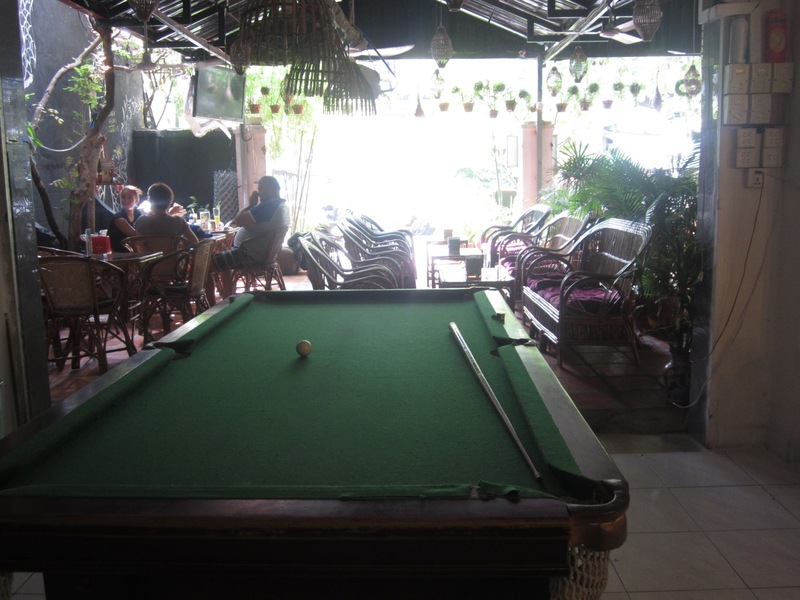 The hostel has a nice common area/bar/restaurant with a pool table and great drink specials. 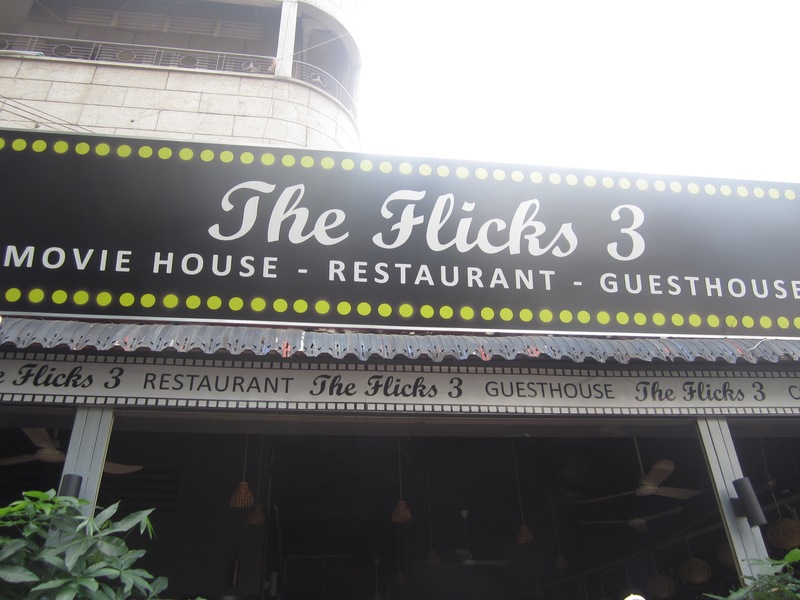 The hostel also has a great restaurant. The food was excellent and if you order dinner during happy hour you get a beer for FREE. Across the street from the hostel is a movie theatre. We did not have enough time to go but this would be an excellent way to escape the mid afternoon heat. 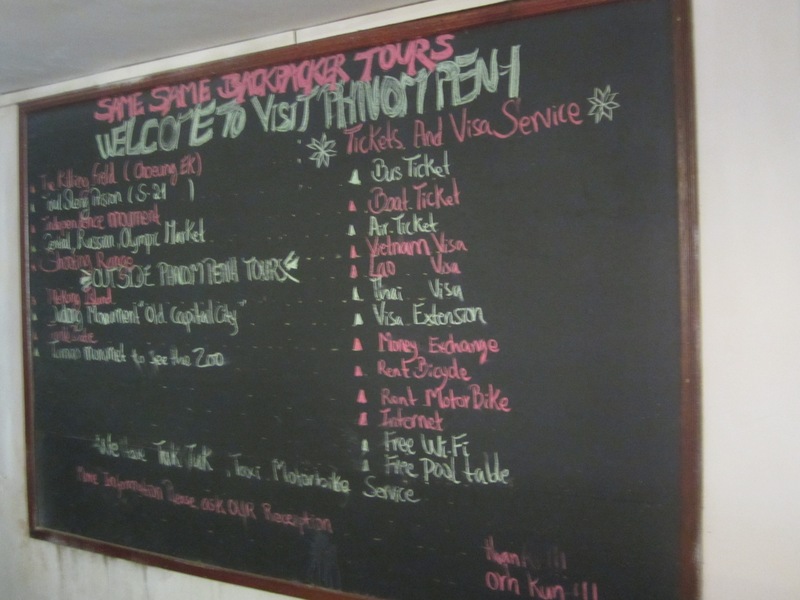 Honestly, Phnom Penh was not really a city for us. It is a big city. There are not very many attractions to see and the ones they have are primarily ‘dark tourism’ types of sites (I will describe further on). 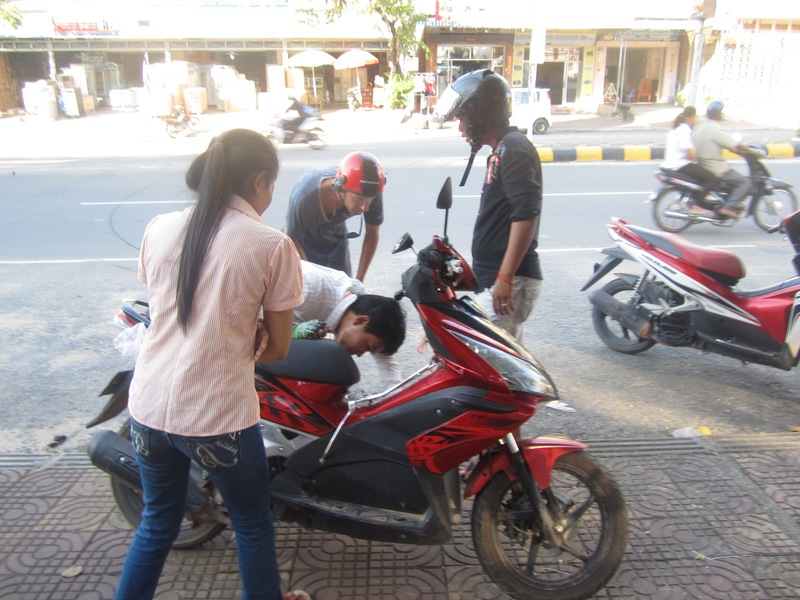 The city also has many beggars, many were victims of the Khmer Rouge era in Cambodia and often are missing limbs due to land mines. All in all we were very happy we only had two nights there. 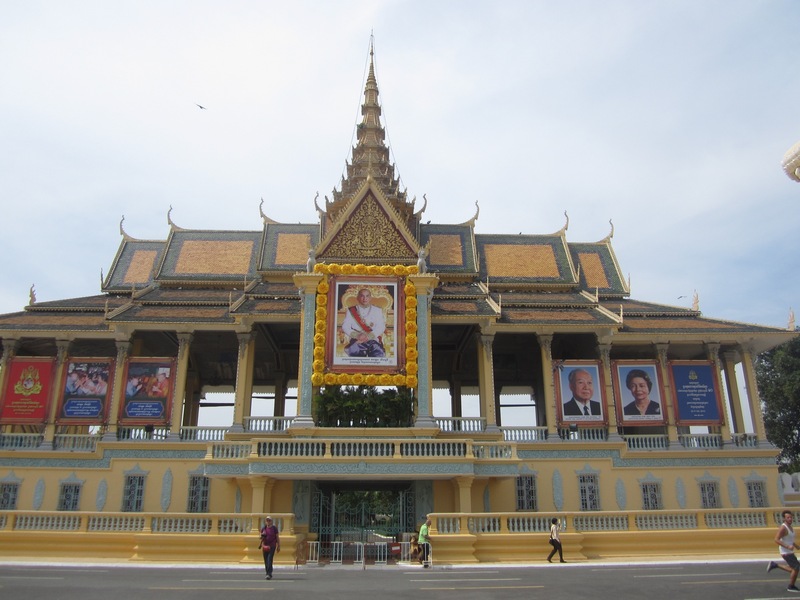 Inside is also the Silver Pagoda which is one of the main attractions of Phnom Penh. We were there at the wrong time of day. So we decided to just enjoy the palace from the outside and save our money. It looked beautiful and I am sure it is worth a visit. 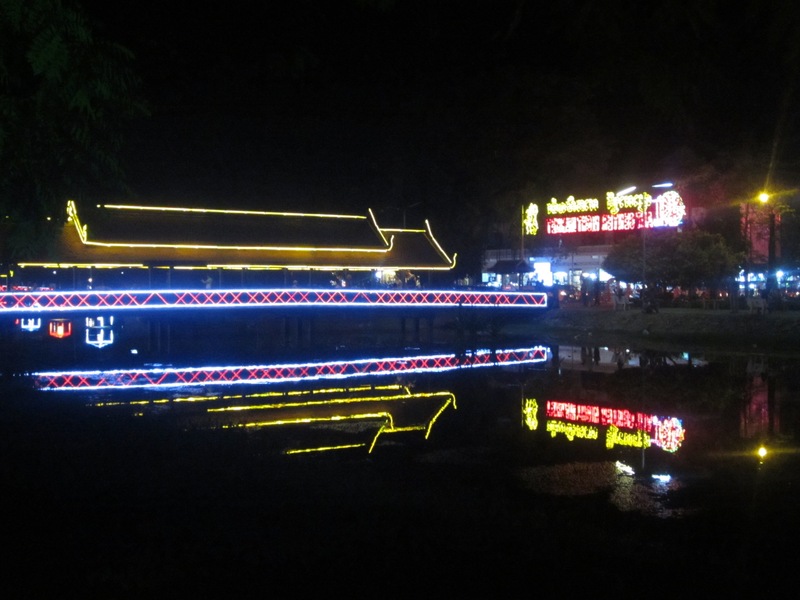 Along the river you will find many lovely restaurants and a few shops. 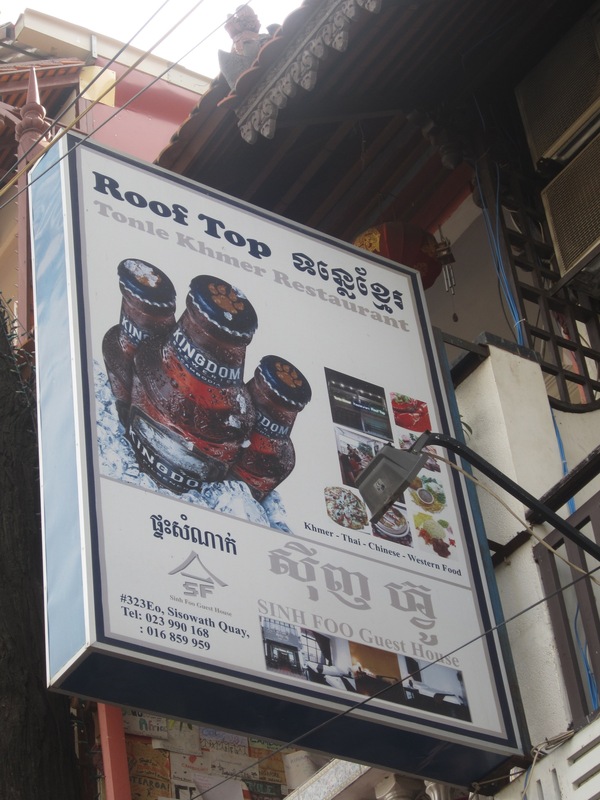 Several of the restaurants also have roof terraces with nice views of the river. I recommend going up for at least a drink. 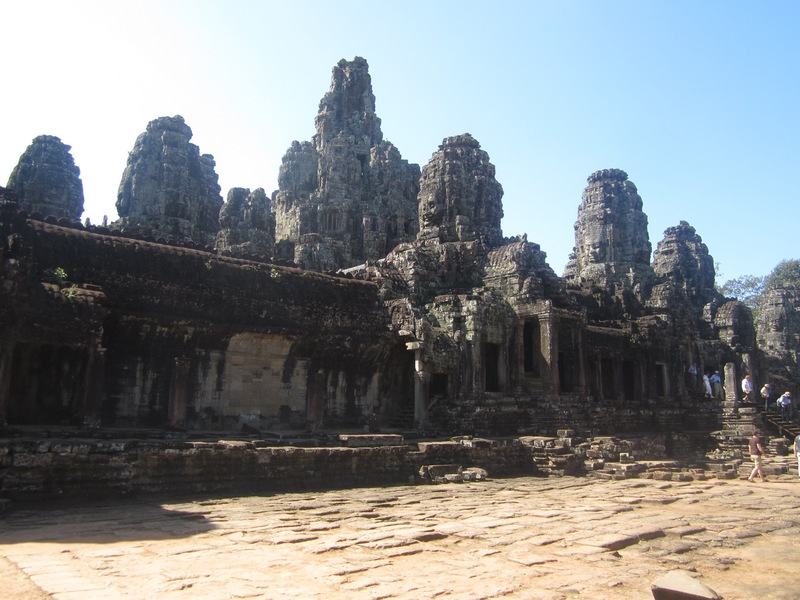 Most of the popular attractions when visiting Phnom Penh simply did not appeal to us for this trip as it is our honeymoon. However, I will list them here in case you might be interested. 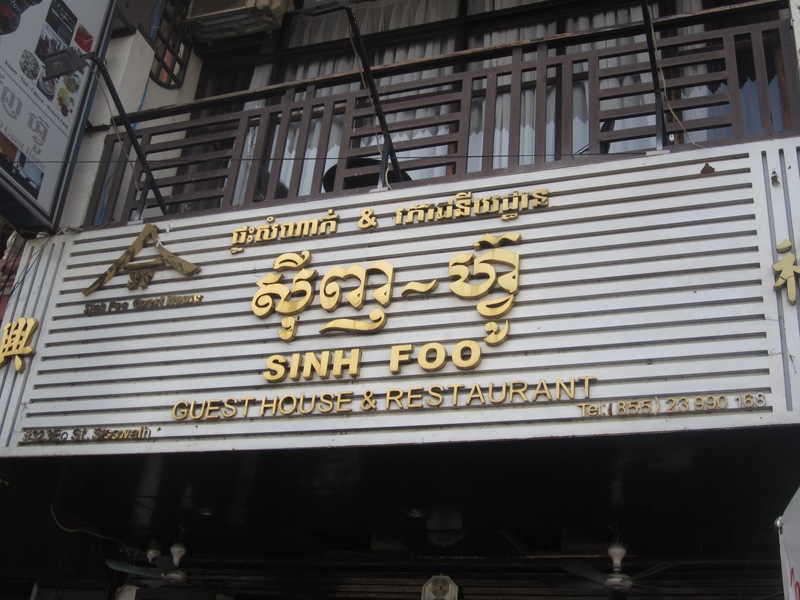 This is the main tourist site in Phnom Penh. 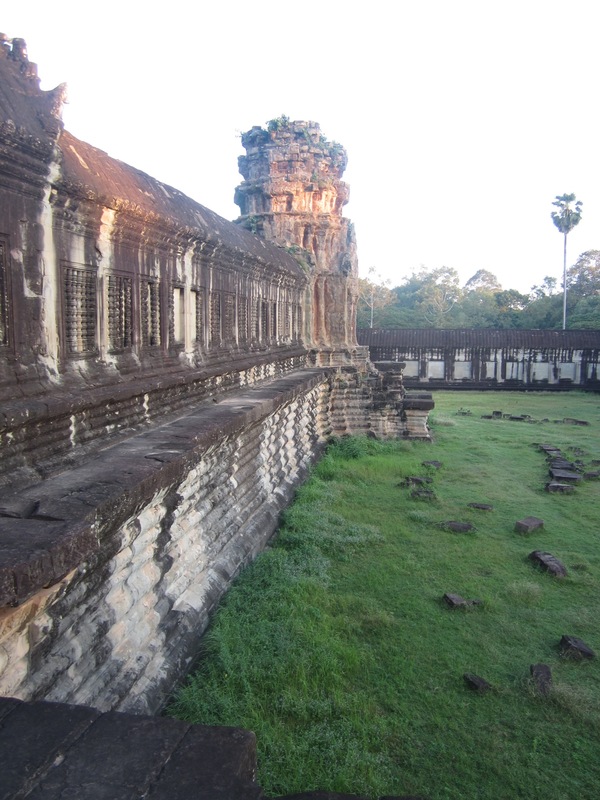 It is where the Khmer Rouge killed thousands of people. 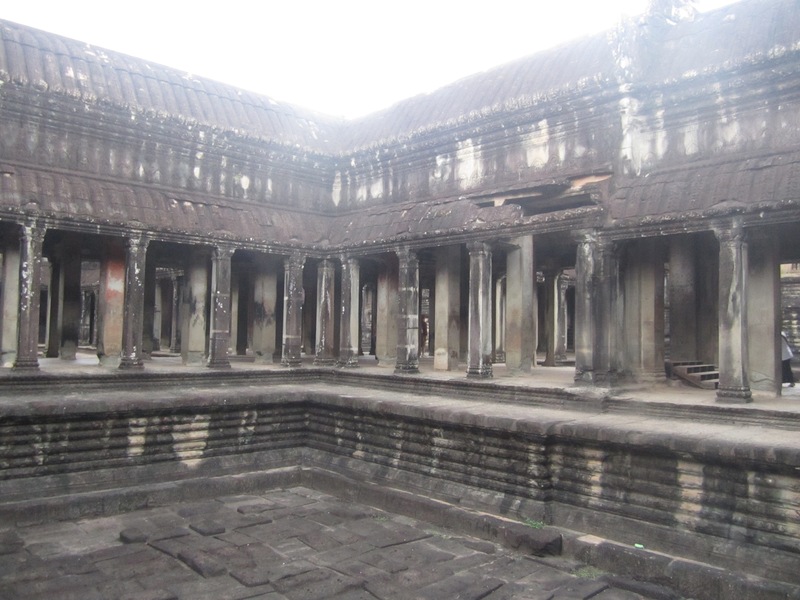 Located in Cambodia’s most important prison during the Khmer Rouge reign ( mid 1970s). 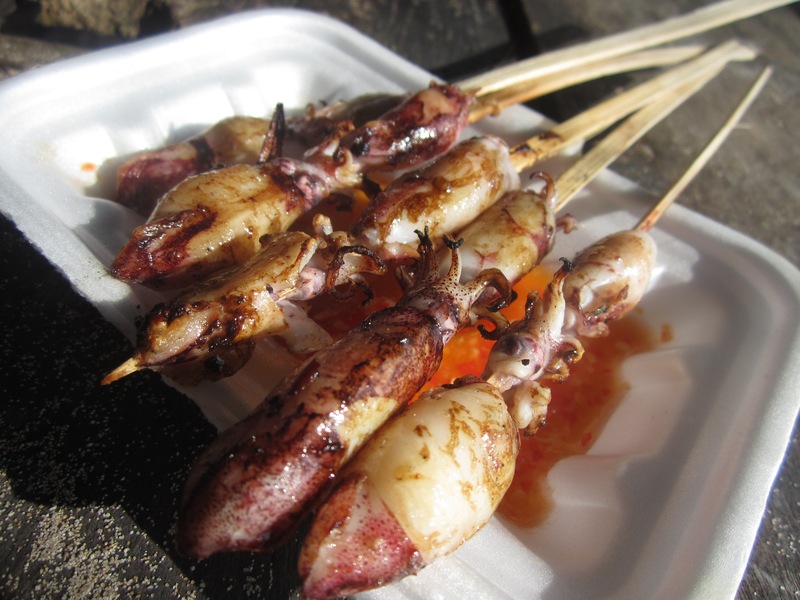 This is something you can try in Phnom Penh but it was not something that interested us. We decided to splurge a bit and go for the VIP bus to have the internet access and a shorter bus ride. The tickets have assigned seats which is always nice. It also included transport from your hotel to the actual bus. The bus was scheduled to leave at 9am and our transfer picked us up about 8:15am. At the bus depot there are several people selling snacks if you need anything for the trip. The seats are pretty comfortable and there is a decent amount of legroom. Advice: if the bus stops and many people are running off to buy something, go buy one too. 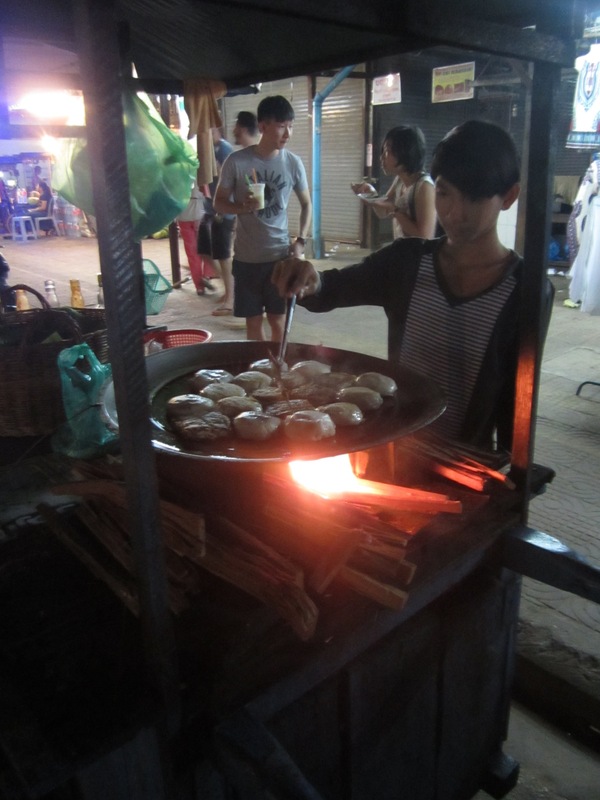 The first stop our bus made was at a road side stand selling what looked like pieced of bamboo roasting on a grill. A ton of people were leaving the bus and buying bags full of these bamboo things, so Glenn got off the bus and bought us one too. It was 2000 Cambodian riel ($0.50). We had no idea what it was. It looked like a piece of bamboo with the outer coating stripped off. The bottom seemed to be open but the top was stuffed with straw. A nice gentleman in the row across from ours reached over and said let me help you. First he pulled out the clump of straw. Then he pulled out what looked like a few wet leaves (maybe bamboo leaves?). Next he started peeling back the bamboo sides, similar to how you would peel a banana. This revealed rice and beans inside! 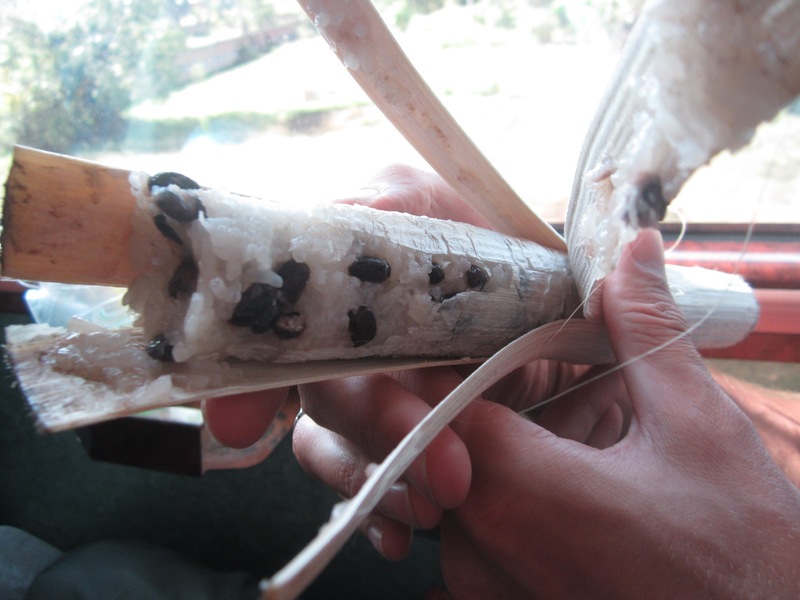 It was a sticky coconut rice and black beans cooked inside a stalk of bamboo! It was a great snack and such an interesting experience. It proves that sometimes you just have to take a chance and you could end up with a great cultural experience, big or small. There is no toilet on the bus but the bus does make several bathroom stops so this was not a problem. The toilets were all squatting toilets so be prepared for that and be sure to bring your own toilet paper as these bathrooms do not have any. Remember to throw the toilet paper in the trash bin and not into the toilet as the plumbing systems cannot handle paper. I recommend bringing snacks on the bus with you mainly for convenience. Definitely buy the rice and beans in bamboo if your bus makes that stop. If we had known what it was we would have bought more than one. You will stop at other places that sell snacks but I am fairly certain that they gave us higher prices than they gave the Cambodians there since nothing was labeled with a price. The snacks are still under a dollar each so it is not a problem. The air conditioning worked well on the bus so that was a great thing. The VIP bus claims to have internet. We were able to find the wifi and enter the password and my ipad seemed to connect. Unfortunately I could not get it to actually work. It was either broken or the signal was simply not strong enough. Be sure to have alternate entertainment for the bus ride in case the wifi does not work. 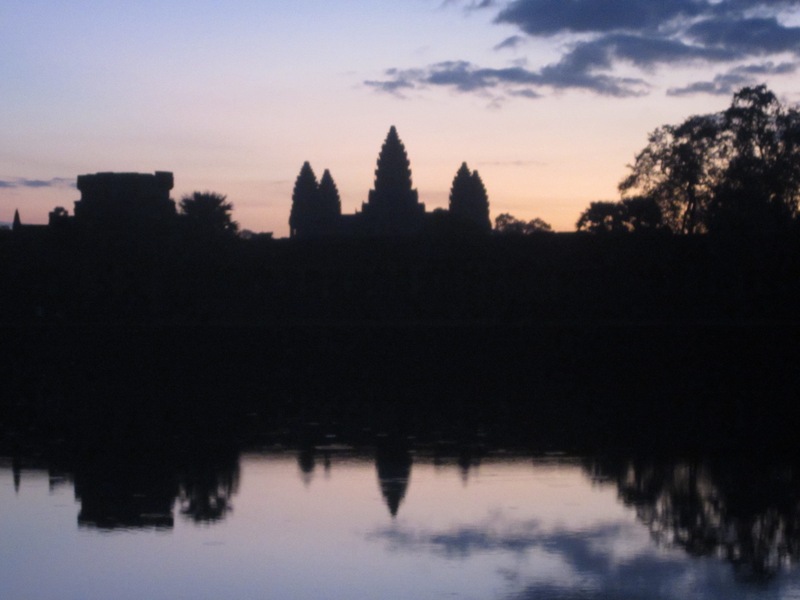 We came to Siem Reap with one thing in mind – to see Angkor Wat and the surrounding temple. 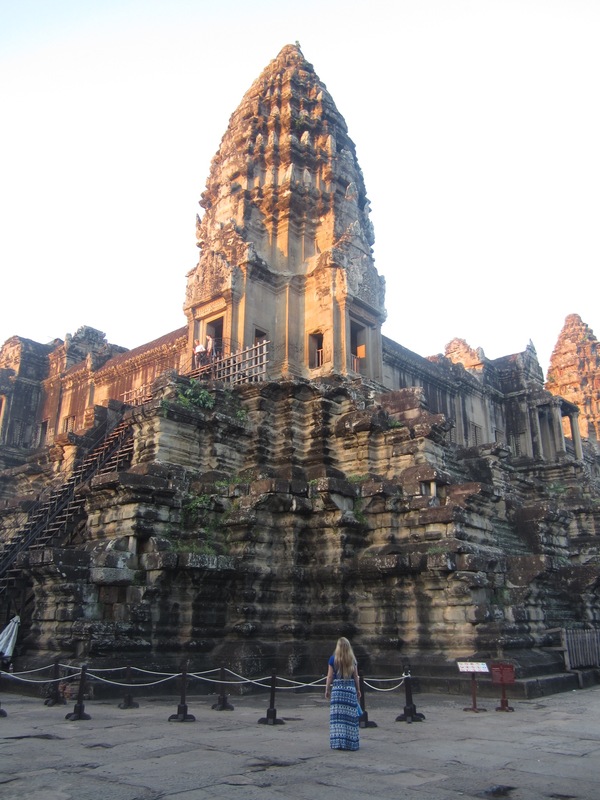 We made the decision to only spend 2 nights in Siem Reap and to then move on to explore other areas in Cambodia. 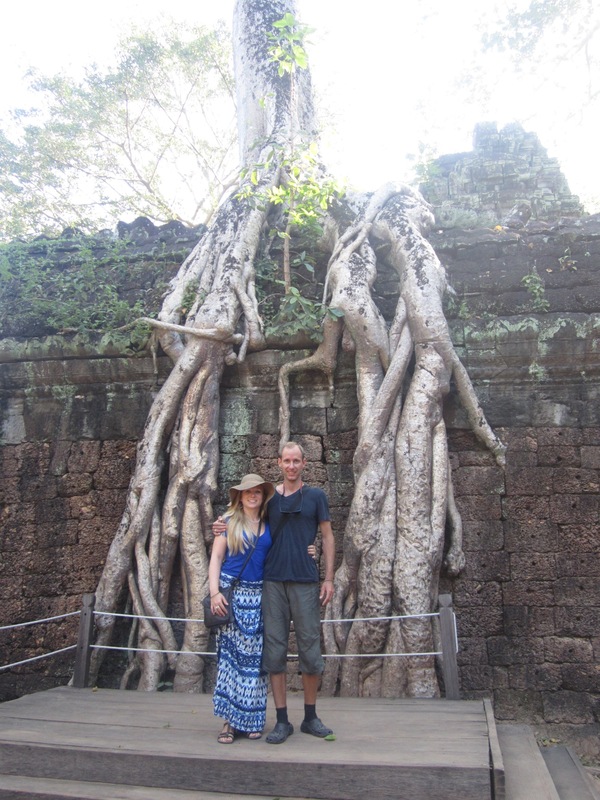 Of course there are many wonderful things to see in Siem Reap but we primarily focused on the temples. 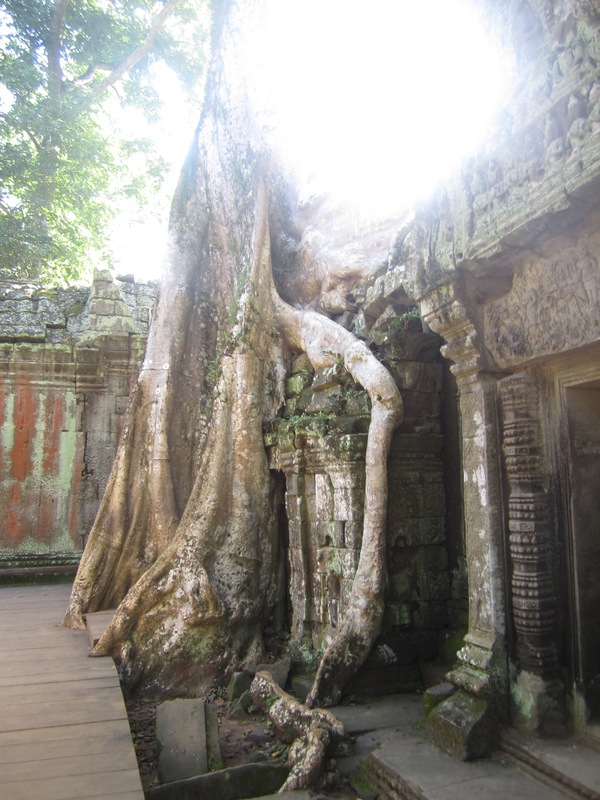 Here is my experience and my tips for visiting Siem Reap. The visa on arrival process is explained in another post. Please check it out! There is no ATM in the arrivals hall but there is a money exchange counter and you can take money out from your Visa or MasterCard similar to an ATM (with fees of course). Outside you can purchase a taxi from the official taxi stand (just to the left of the exit). Standard fee from the airport to anywhere in the city in $7. If you want a cheaper taxi you will have to walk a few kilometers down the road away from the airport, likely this will only cost $1-4, but we decided to just take the taxi directly from the airport for the convenience. Our hotel was lovely. Glenn found it on the discount website Agoda (we have had amazing luck with this site and get great discounts). We had a private ensuite double room with air conditioning for $10 per night. Each floor has a lovely communal balcony and in front of the hotel is the garden restaurant. 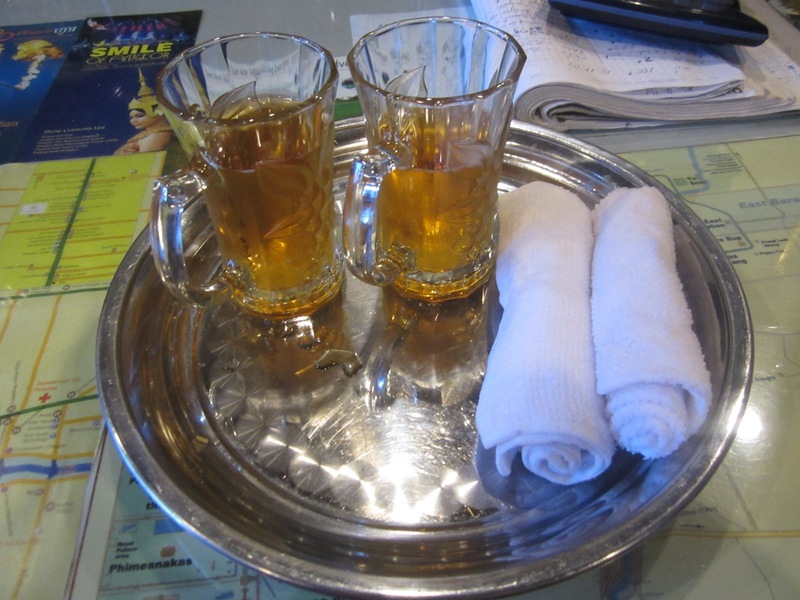 When we arrived to check in we were each given a nice cold iced tea and a cold towel. Such a lovely welcome! This hotel had great, reliable wifi in both the public areas and in the rooms (though the signal is a bit stronger on the balconies and restaurant area). Our room also had a TV, the signal was not perfect as the TV was old but it had many channels, including a few movie channels. 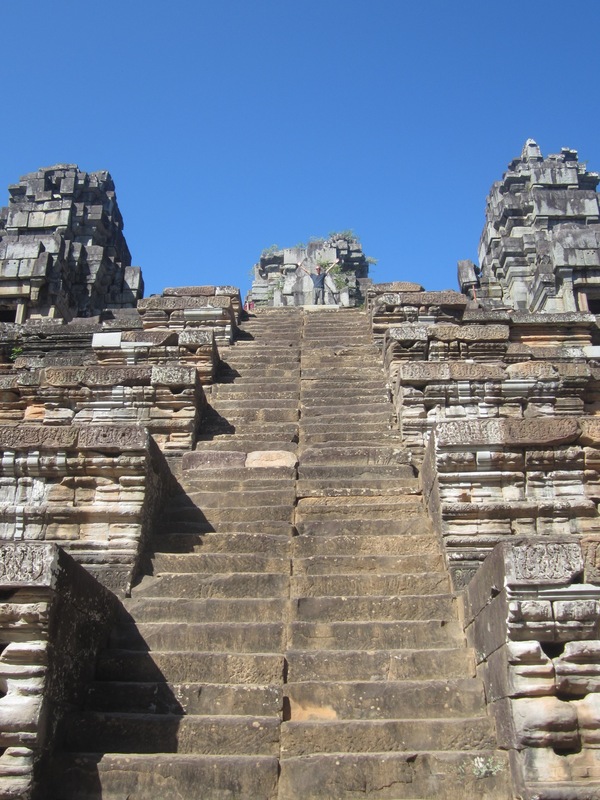 Even though on the map the temples do not look too far from the city center, you absolutely cannot walk, it is too far. 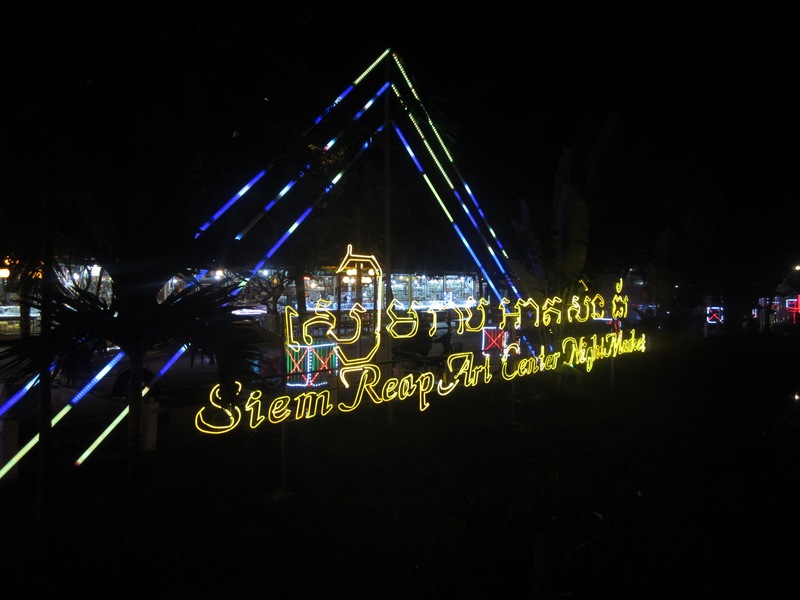 There are several ways to visit the temples though. 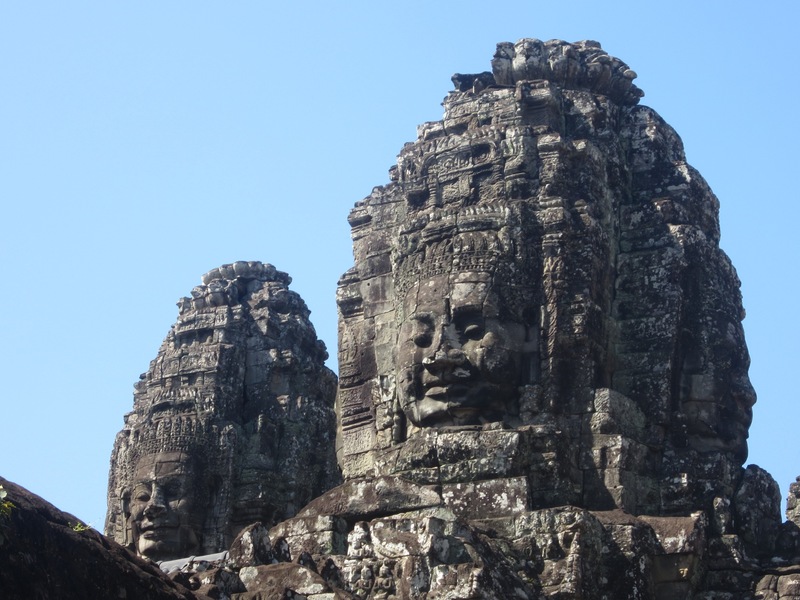 – note this is a nice cheap option but remember that the temples are pretty far from the city and far apart. If you choose to go on bicycle you will not see nearly as many temples in one day as the other two options. 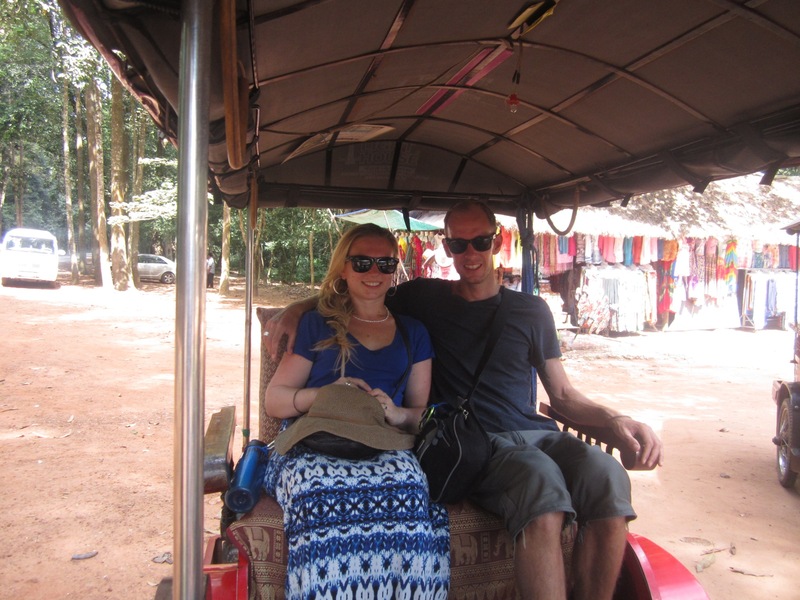 We chose to book a tuk tuk as it is the most traditional way of seeing the temples. Our hotel arranged this for us. Our driver picked us up at our hotel at 5am (before the sun is up). Here we are later in the day. You will stand in a long line with all of the other sleepy tourists but don’t worry, they are very efficient and the line moves quickly. When it is your turn, first they take your photo, then you pay, then they hand you your ticket/pass printed with your picture on it! Such a great system. Keep this pass in a safe but accessible place because you will have to show it at the entrance to every temple. 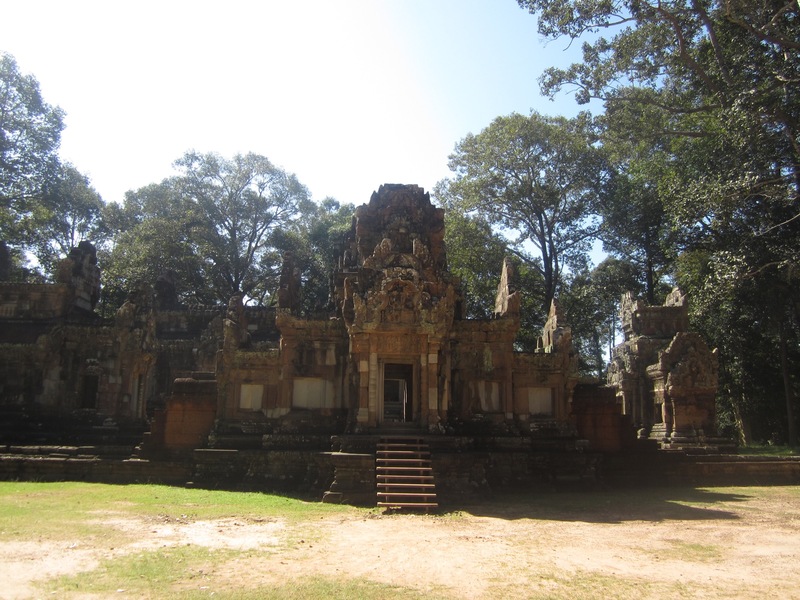 Angkor Wat temple is the shining jewel of the Angkor temples and this is where your tour will start. I highly recommend getting up early for sunrise over the temple. Yes you will have to leave your hotel at 5am but the view is simply breathtaking. You will not be alone, these are the crows that will join you for sunrise. 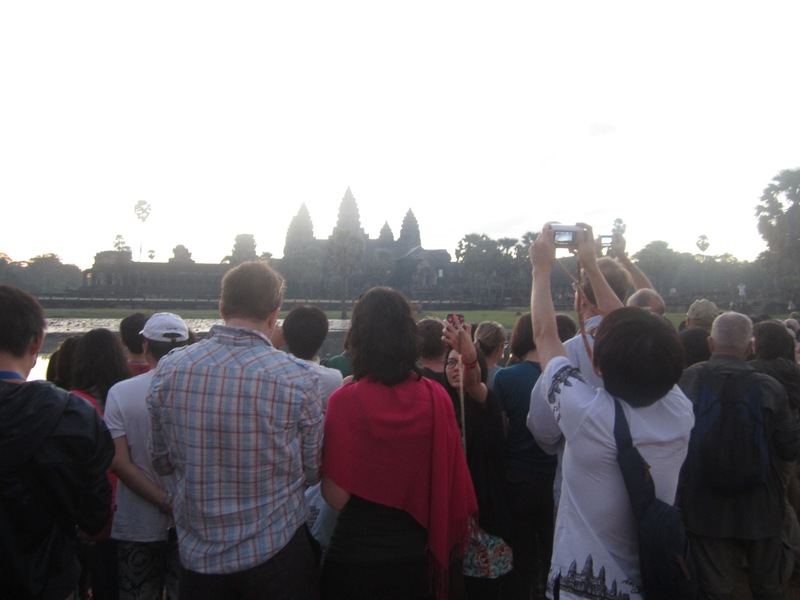 Don’t worry though, there is plenty of space for everyone and the crowds will not affect your amazing photos. 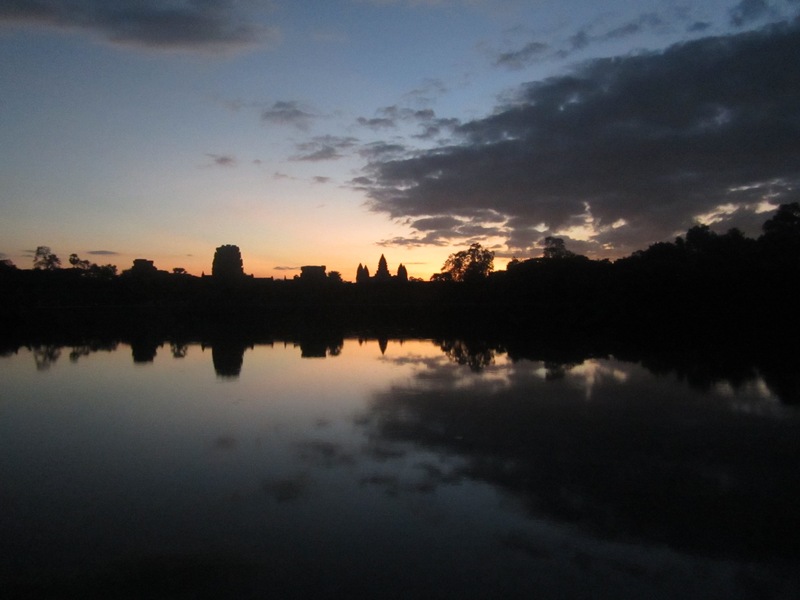 Once the sun is up (at 7:30) Angkor Wat is open and you are free to explore and enjoy. Here is a taste of what you will see. Just along the edge of the temple several vendors have sprung up so you can easily get your morning cup of coffee or some breakfast with beautiful views of the temple. 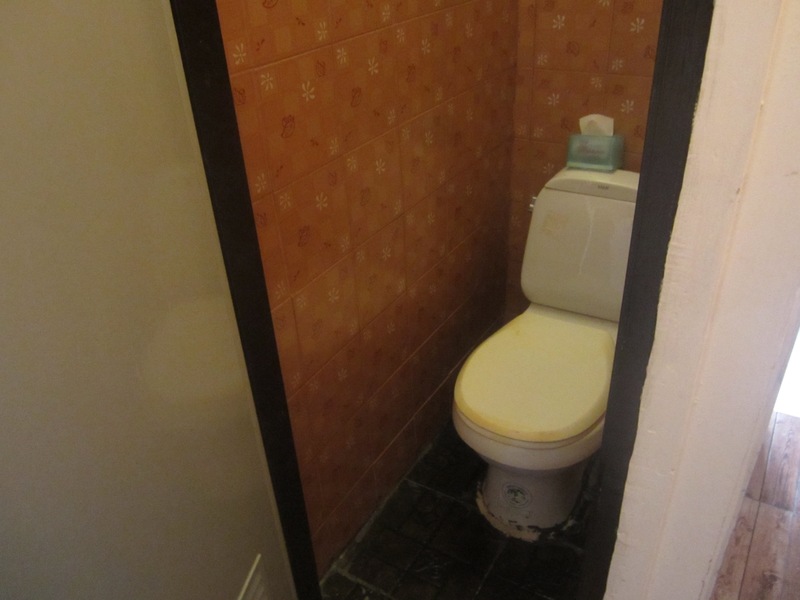 There are also toilets available (some free, some for a small fee). Remember to bring your own toilet paper as it likely is not provided. 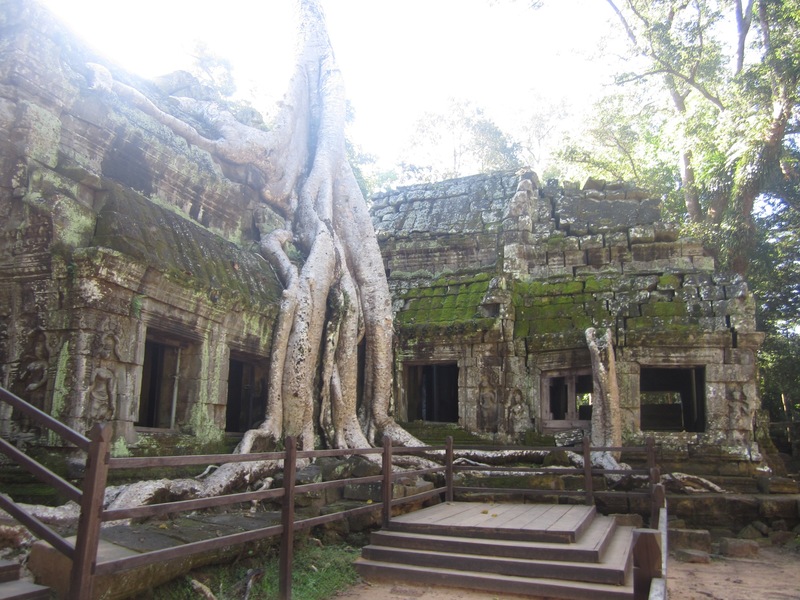 Ta Prohm Temple is a common second stop for tours of the Angkor Temples and is probably the most well known temple other than Angkor Wat. 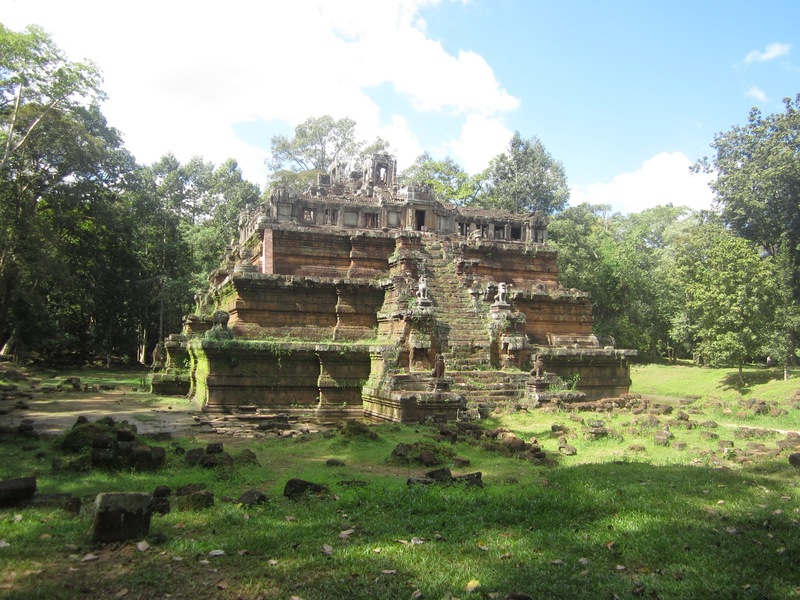 It is sometimes referred to as the Jungle temple or the Tomb Raider temple (as scenes from the Tomb Raider movie were filmed here). 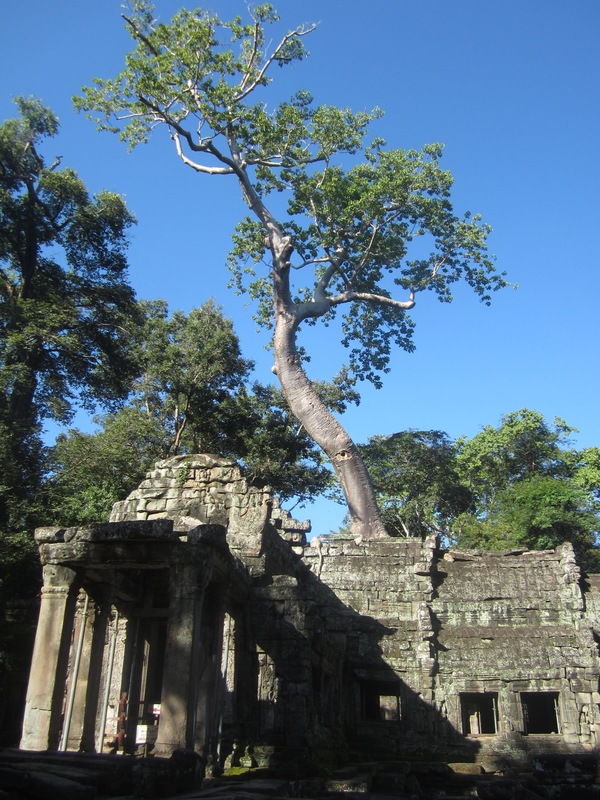 It can be recognized by the large trees that have grown into the remains of the temple. 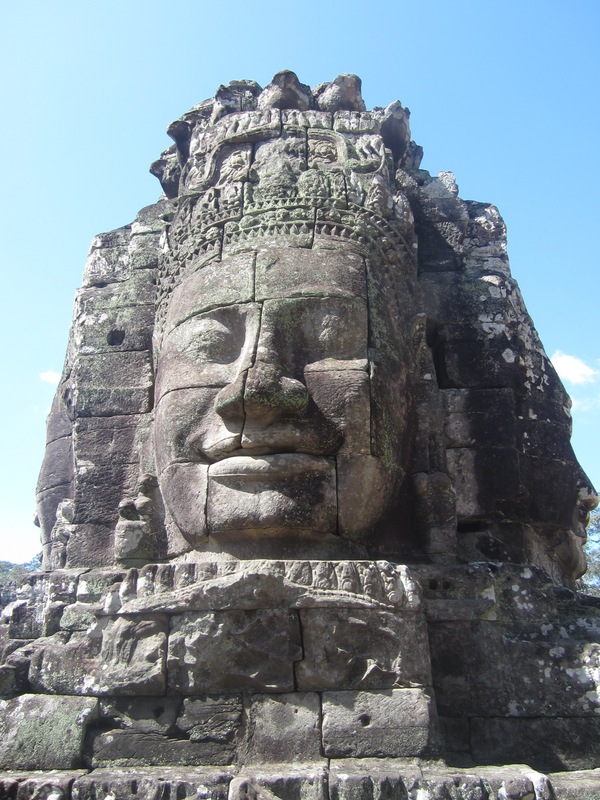 Bayon Temple is also known as the Temple of Faces because of the many faces carved throughout the temple complex. 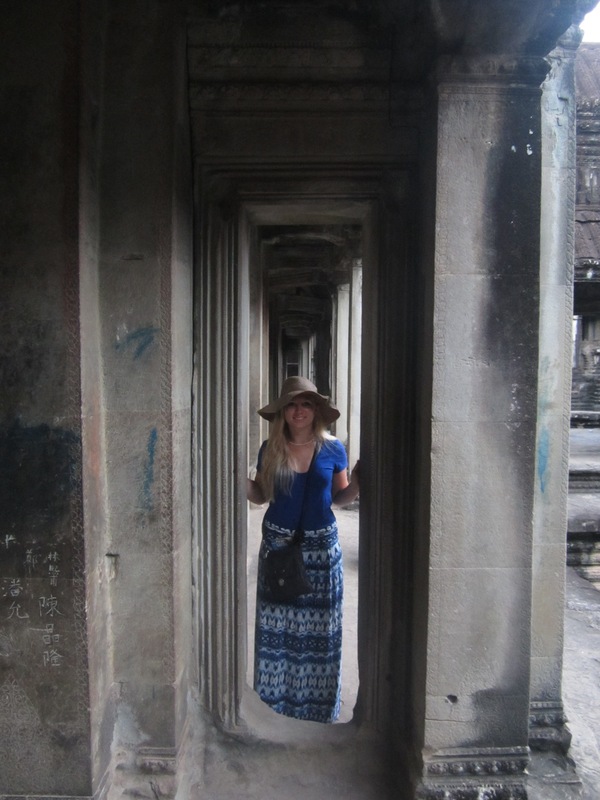 There are so many temples at Angkor that there is no way you can see them all in one day. 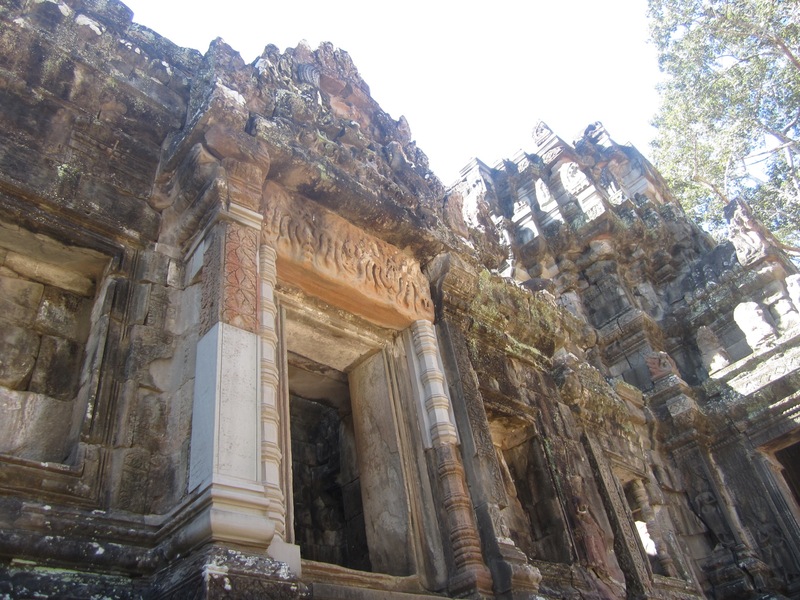 There is also no way to easily keep track of the temples and their names. This may be a bit easier if you go with a certified guide (prices from $40 according to what we heard), but we had only a tuk tuk driver who spoke limited English. We do know that he took us to the major temples but we don’t know all of the names. 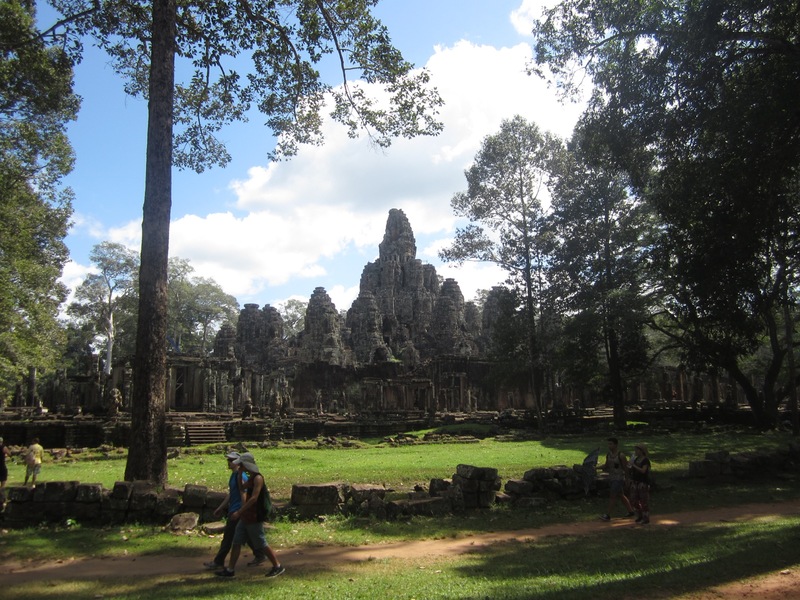 For us this was ok. Angkor is so overwhelming that on a first trip you just wonder at everything you see and take pictures. Your brain just can’t absorb everything at once. I plan to read a bit more on this area and time period when I return home and maybe go back for a second, more informed visit. 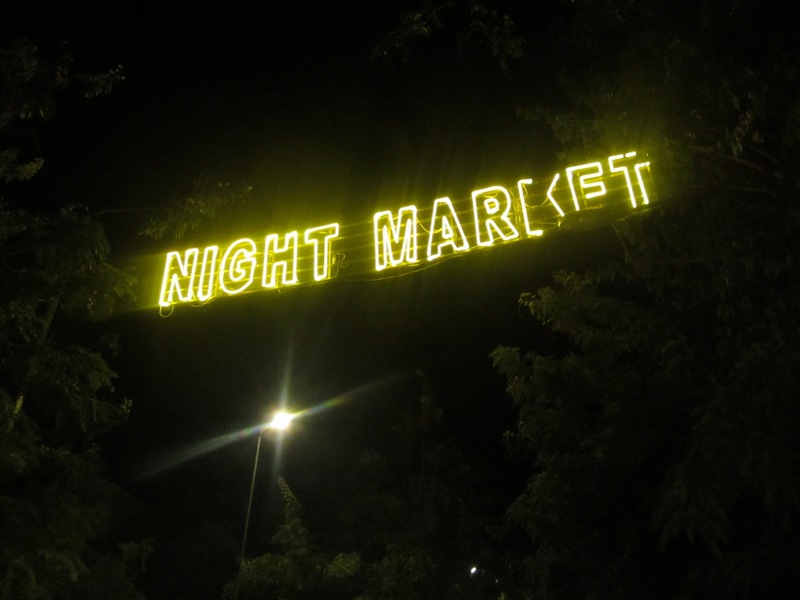 For souvenirs your best bet is to visit the night market, open every day from 4pm to midnight. For food and bars, head across the river to Pub Street. 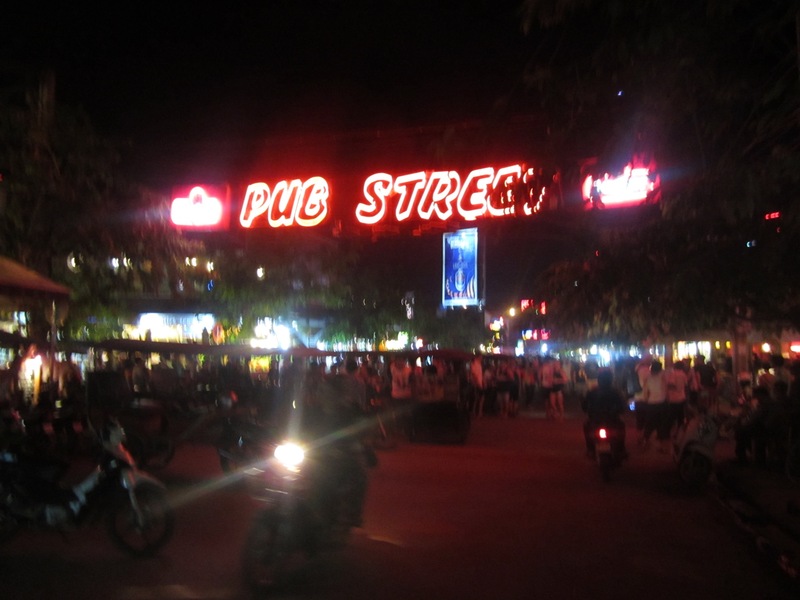 The first thing we ate when we started exploring the main area of the city (Pub Street) was from a food cart. We just went over for a look but 2 other tourists were waiting and highly recommended the food saying that they have eaten one every day from the same cart. 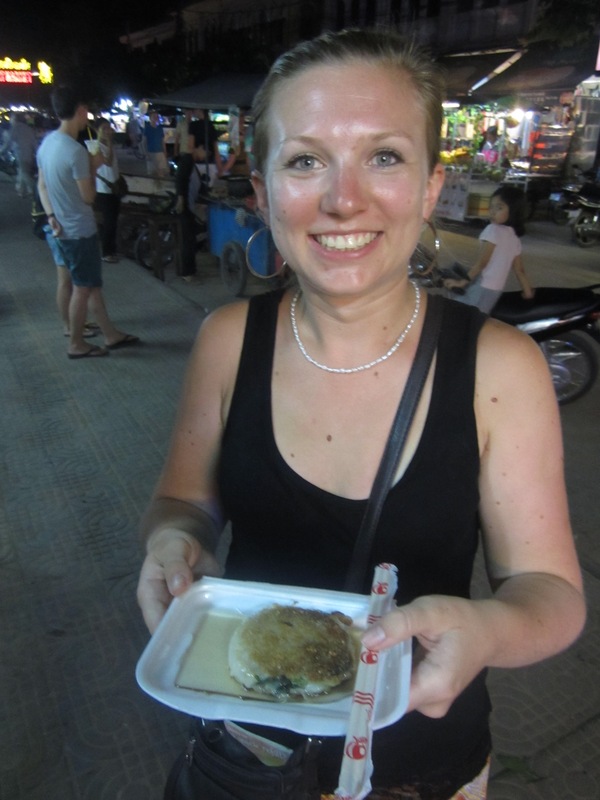 Basically it was a sort of cake made from rice flour (we think), filled with sautéed green onions and then fried. It then has some sort of thin sauce poured on it but we could not understand what it was. This snack was delicious and we definitely recommend it if you see this cart. 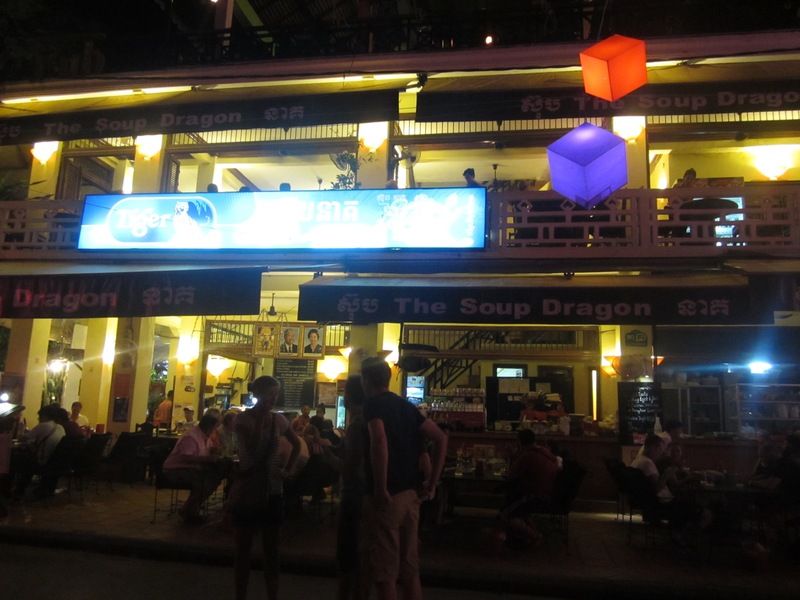 Our first night we went to dinner at a restaurant called The Soup Dragon. It looked great from the street and I remembered reading about it in our Lonely Planet book so we decided to give it a try. 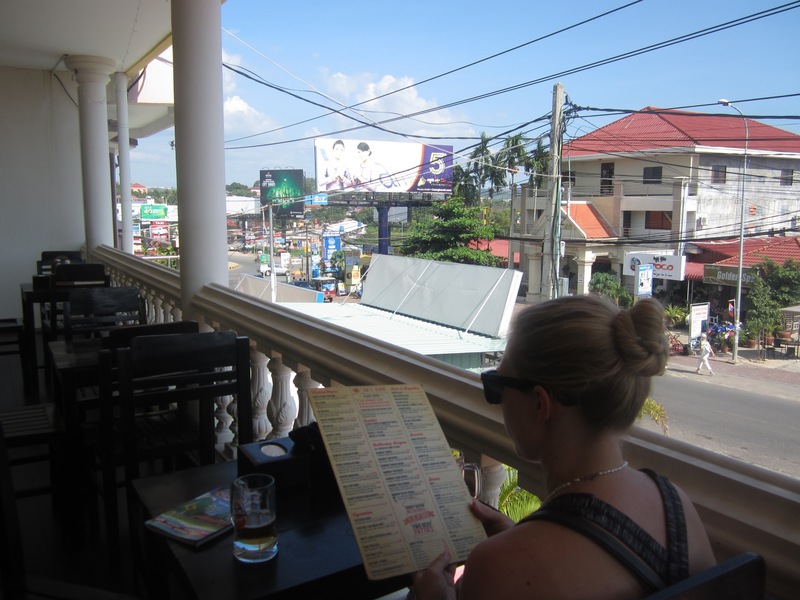 The food was excellent and so was the view, we ate on the second floor terrace overlooking Pub Street – a perfect spot for people watching. 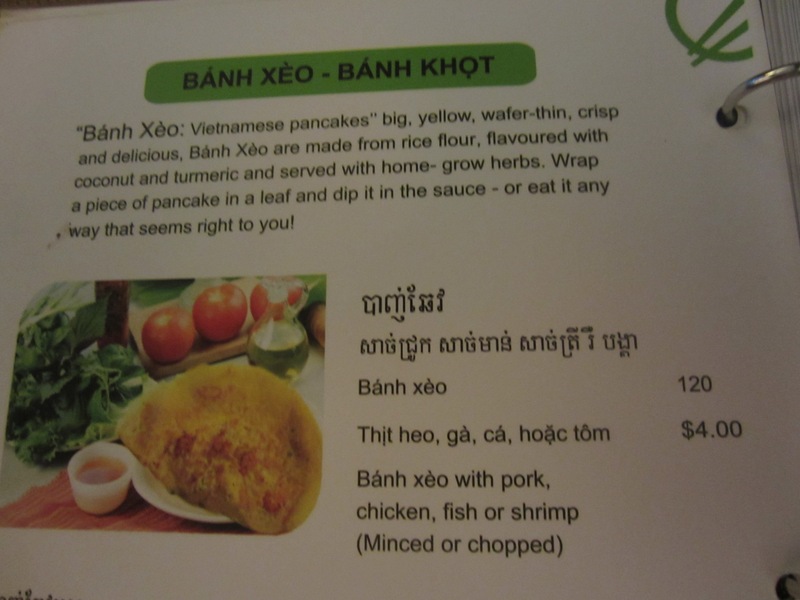 We decided to order one of the ‘pancake’ that was recommended by lonely planet. 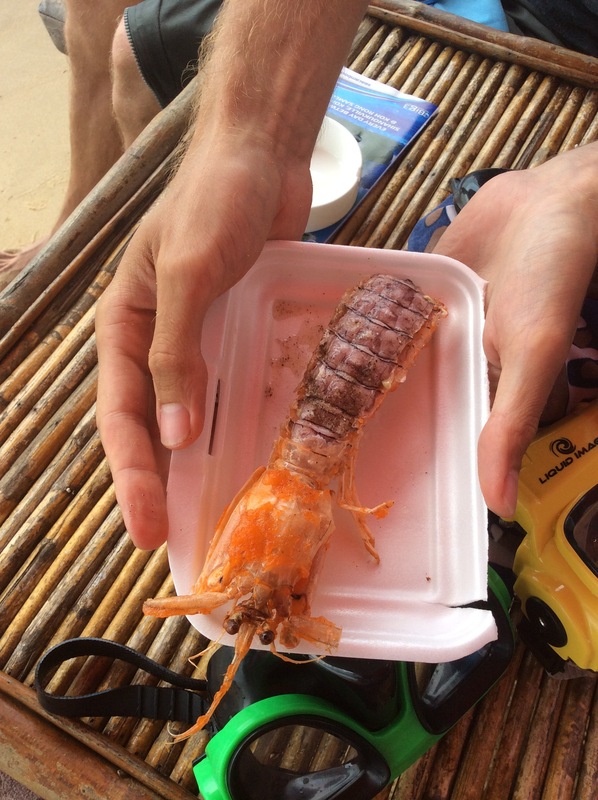 Our waitress had to explain to us how to eat it. First take a leaf of lettuce. Fill it with bits of the pancake and filling. Dip in the delicious mystery sauce (we never figured out what it was). Eat. Here I am eating so gracefully. 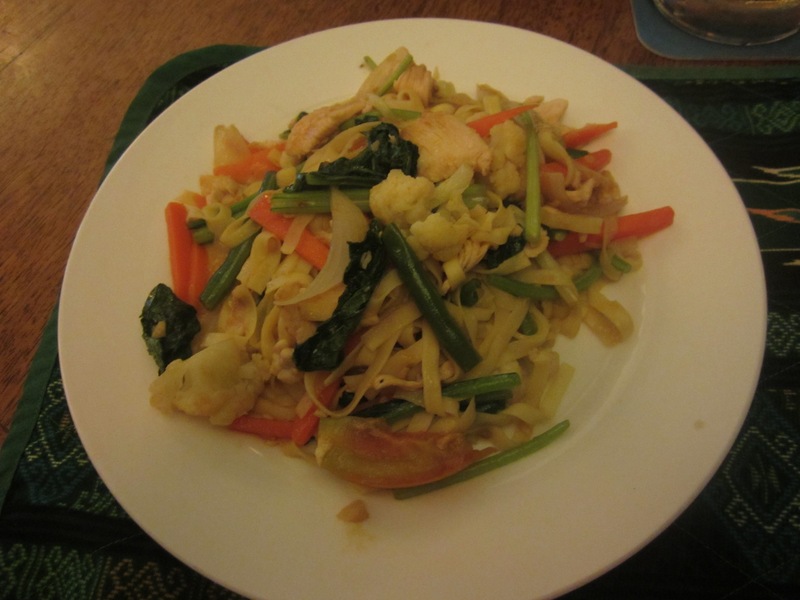 I would not say this dish is easy to eat but it is delicious! 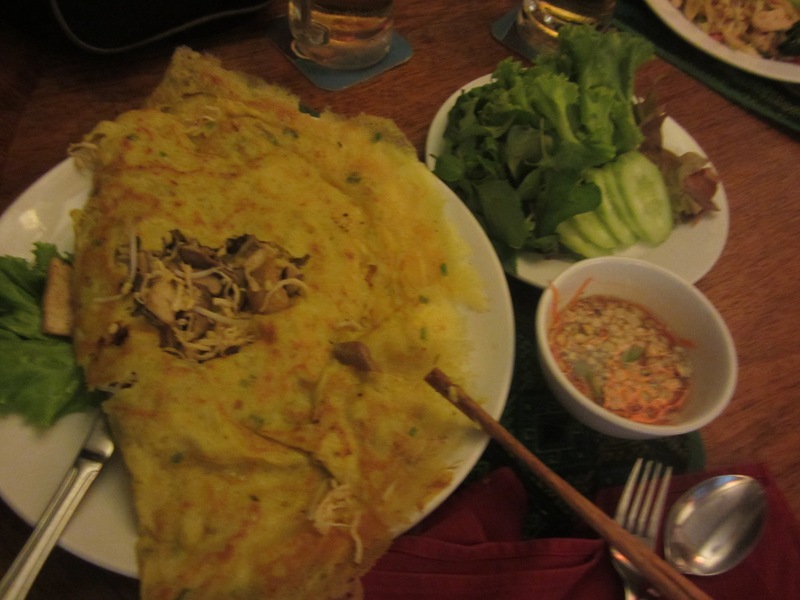 We also ordered a fried noodle which was equally delicious. 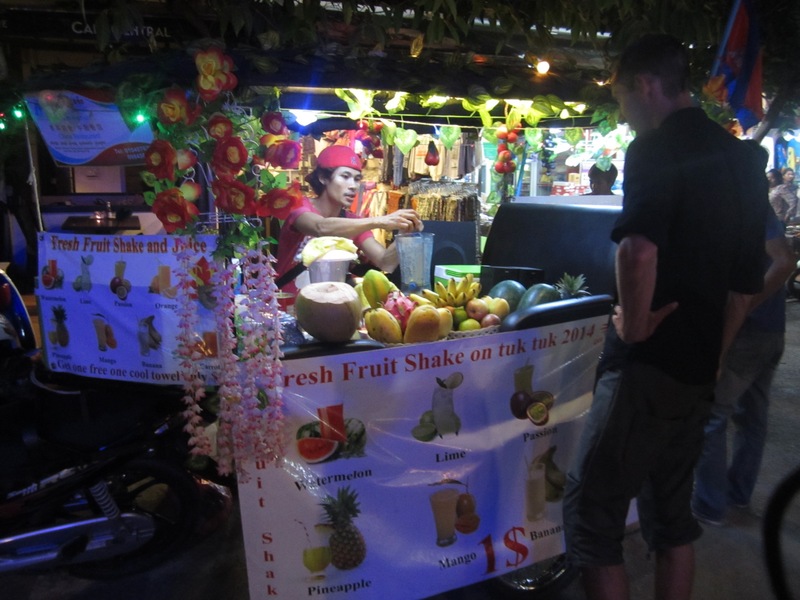 After dinner our first night we bought a juice from one of the street carts. 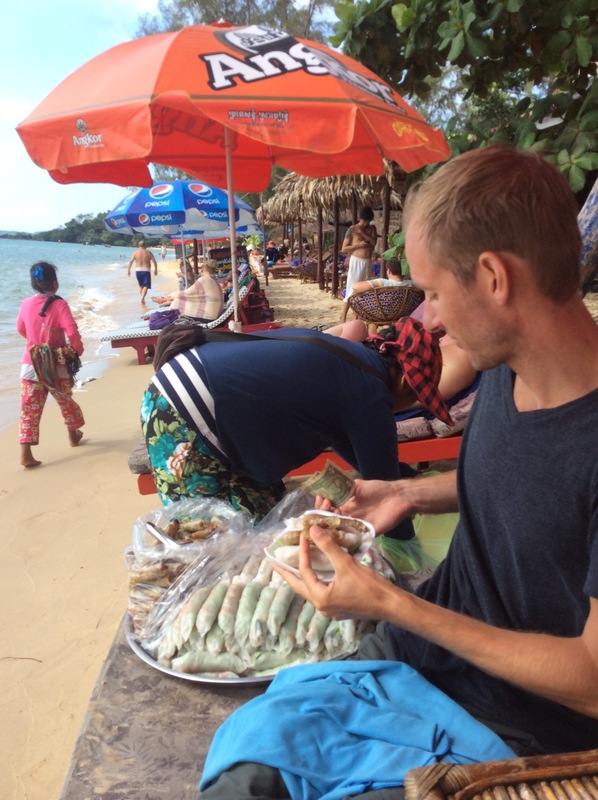 Glenn remembered these tasting amazing on his last trip to Siem Reap and he was right! Into a blender went fresh passion fruit, water, some unknown clear liquid (maybe simple syrup but I do not know) and lastly a bit of condensed milk and out came magic! So good and only $1. I recommend buying one every day! On our second night we decided to just eat at our hotel because we were tired from our day at the temples and the menu looked great. 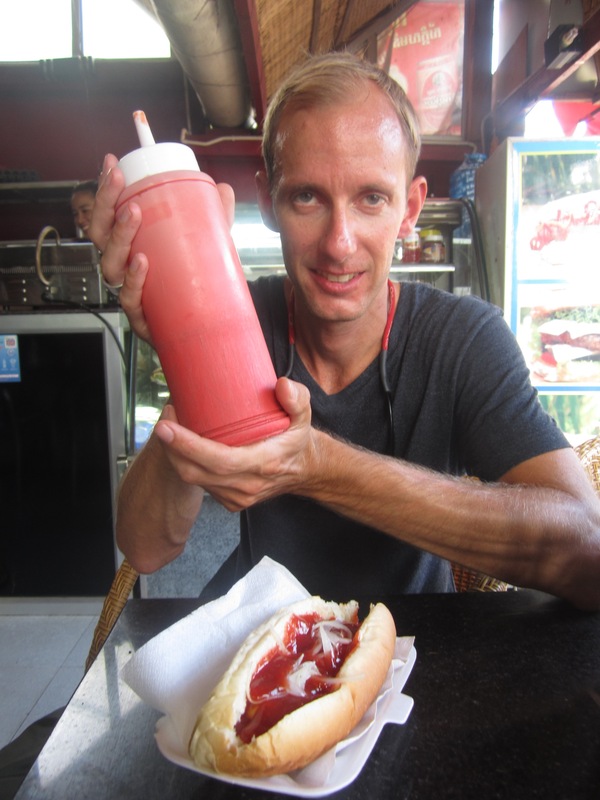 Glenn ordered a burger because he needed some meat after so many vegetarian meals over the last month and a half. I ordered something called Vegetarian Coconut AMOK. I had no idea what it was but it sounded intriguing and I decided to go for it. It paid off! Such an amazing meal. 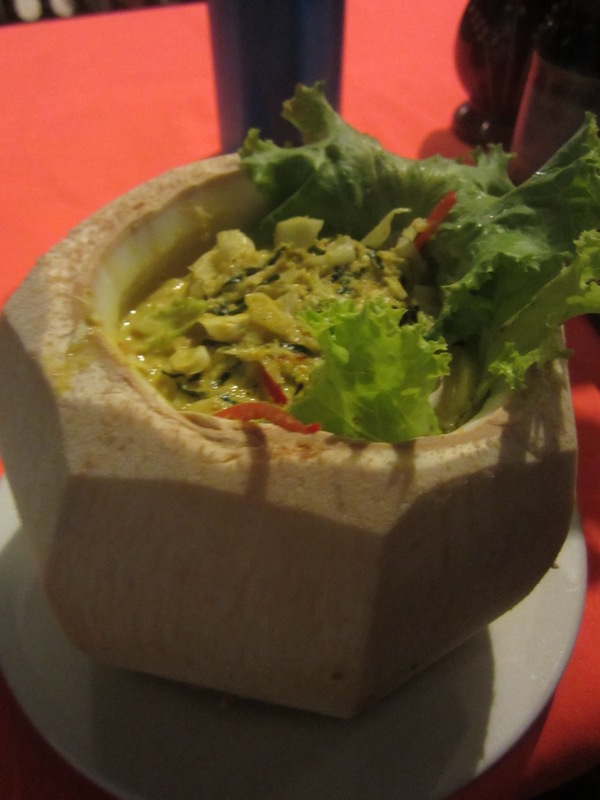 It was various types of shredded cabbage and bit of red bell pepper and a few other vegetables in a yellow curry coconut sauce, served in a coconut with rice on the side. I will definitely order that again! 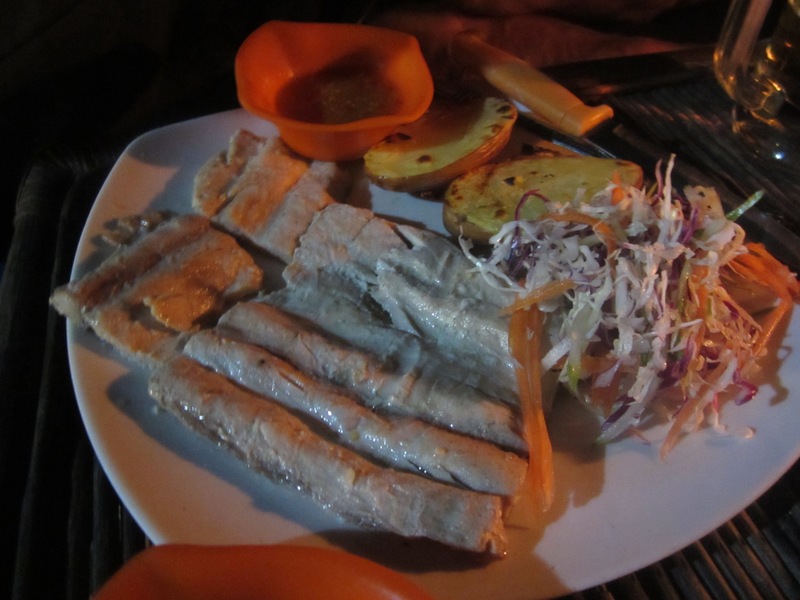 I later learned that AMOK is the national dish of Cambodia and something you MUST try when you visit. You will not be sorry. Breakfast was not included in our hotel booking but it is offered by the hotel. Our first morning we just ate some food we brought with us because we left so early to visit the temples. Our second morning i decided to get breakfast to go from our hotel to take on the bus. 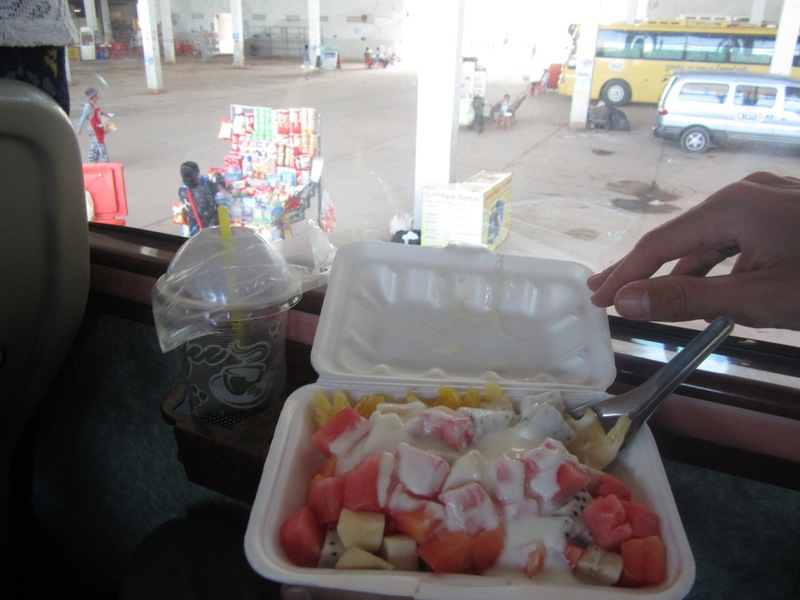 Fruit and yogurt for $1. Wow so amazing. I got so much more than I ever expected! Banana, papaya, pineapple, passion fruit and watermelon with a wonderful yoghurt on top. So delicious. 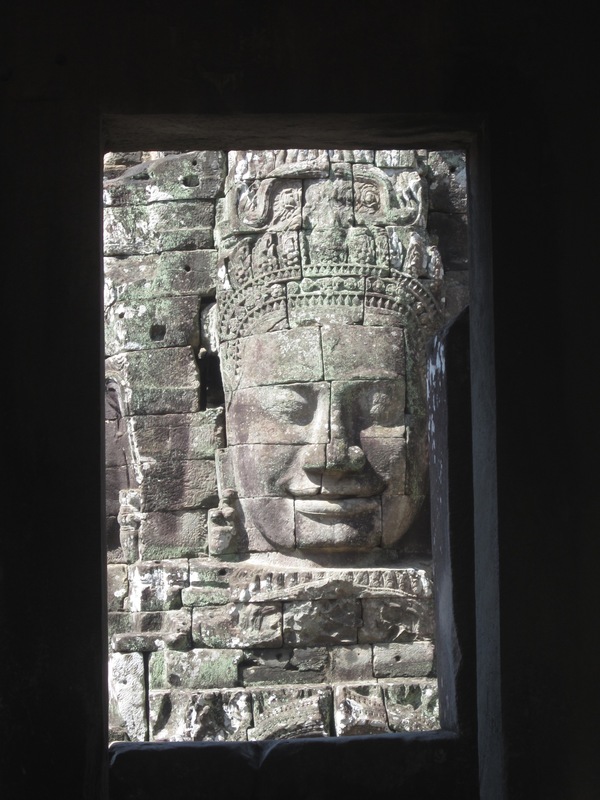 To enter Cambodia you do need a visa but this can be done quickly in the airport when you arrive so there is no need to worry about it in advance. On your flight you will be given two forms to fill out (basically identical), an arrivals form and a customs form. Fill both out. When you exit your airplane you will be directed to the visa on arrival, arrivals hall. Outside you will be given a health form to fill out. This will be taken at the door and you will receive a yellow receipt. NOTE: you must have 1 passport sized photo for this application. Next you go to the payment window. The 30 day visa on arrival currently costs $35 per person. Have the cash with you as they do not accept credit cards and I saw no ATMs in the arrivals area. Your passport will then be passed along a line of about 5 people to be stamped and add the visa to the pages. (You can see this all happening behind the counter so do not stress about them passing around your passport). Then the last person will double check your photo in your passport with your real face and return your passport with the visa inside.